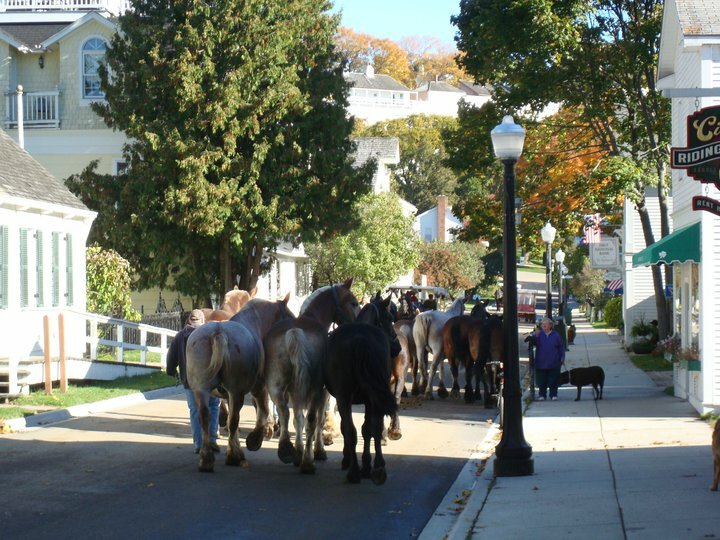 Personal Note: I’m often asked where the horses go in winter when they leave Mackinac Island. 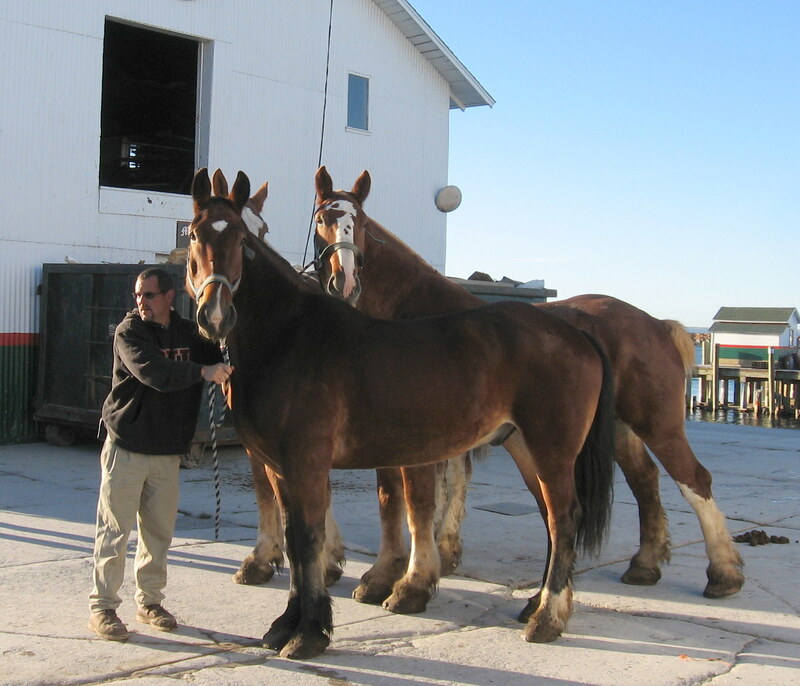 Several years ago I wrote a two-part blog that followed a group of horses on their journey from the island to their winter quarters. 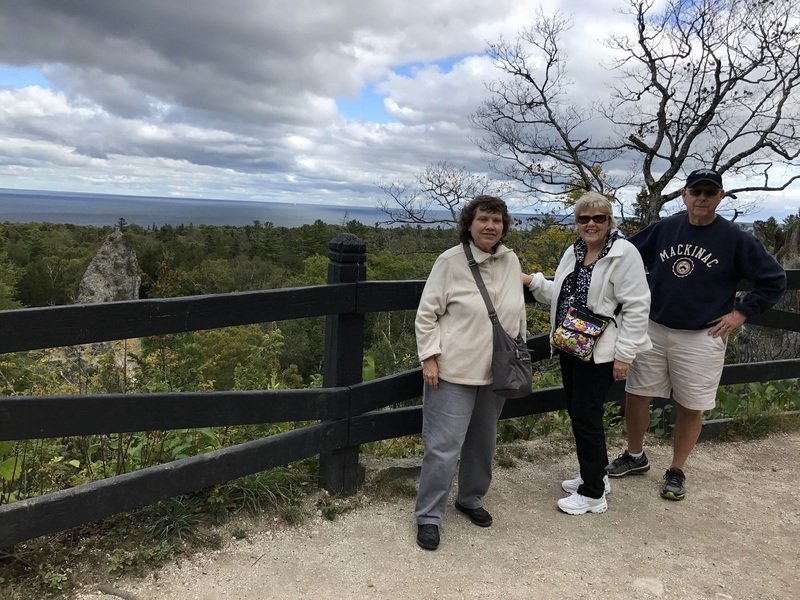 I was privileged to be allowed to travel with them on the ferry to St. Ignace and then in a caravan of trucks (pulling horse trailers) into the upper peninsula of Michigan. 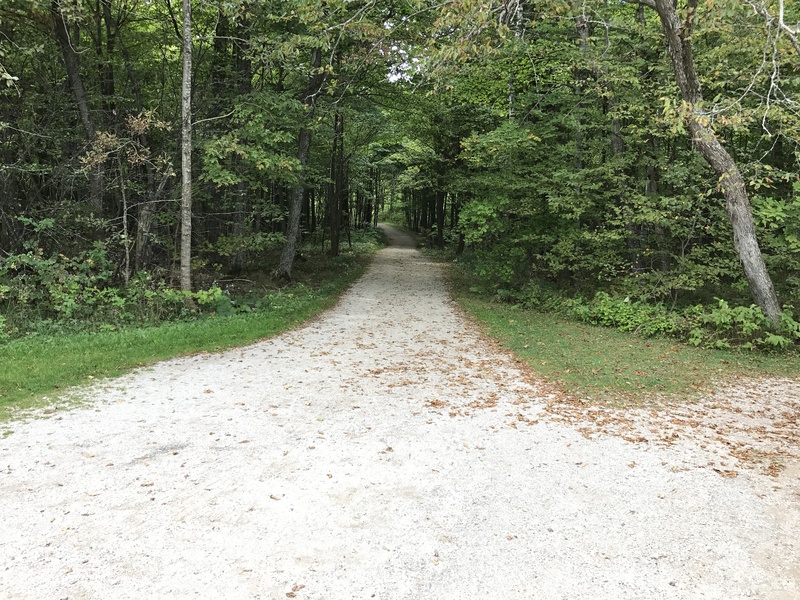 Below is the first part of that blog, and I’ll post the second part, “To Fresh Woods and Pastures New”, on Sunday. Hope you enjoy! That was one of dozens of questions I asked Wednesday and Thursday. I’ve always wanted to go to the Pickford farms, where the horses of the island go to spend their winters, but I was beginning to think it wasn’t going to happen – at least not this year. 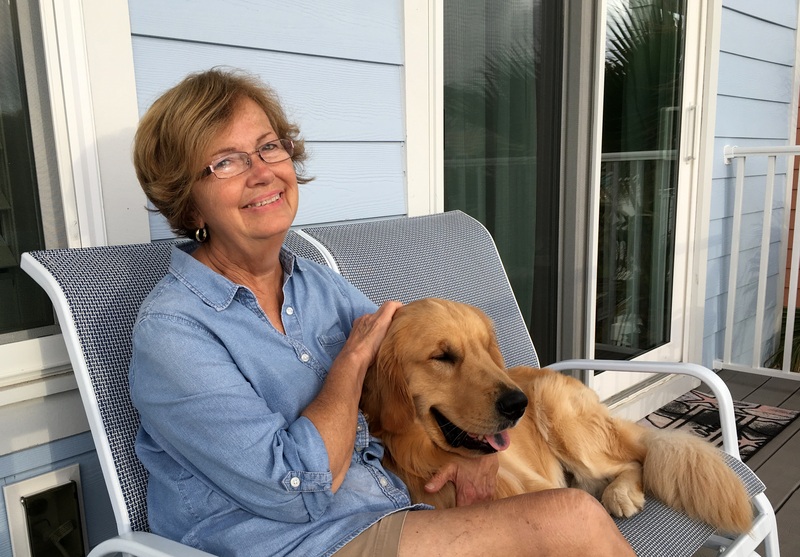 Then a few days ago I put a bug in Doc Al’s (the island vet) ear that I’d like to do this story, and he asked all the right people, and all those people said “ok”. 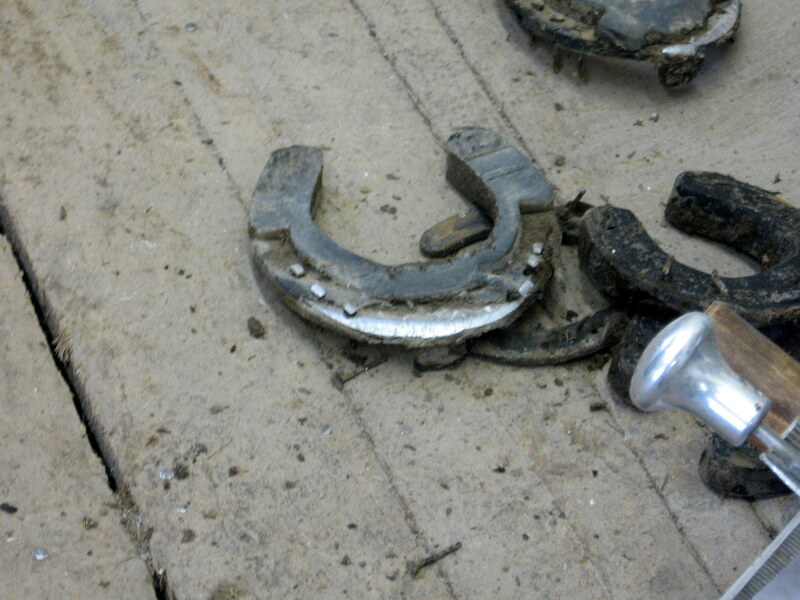 So there I was at the big horse barn on Wednesday afternoon, where I’d been told by Dale Peterson (who runs the barn) I could watch the blacksmith remove the shoes from some of the horses leaving the island on Thursday morning. 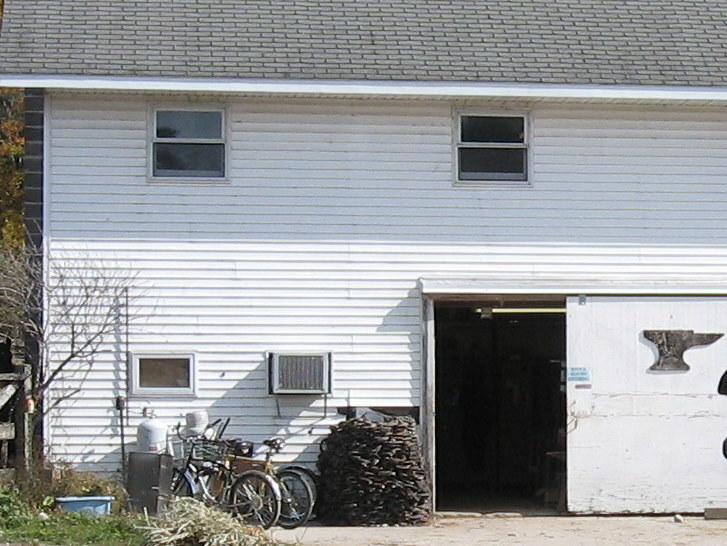 I’ve never been inside the blacksmith’s shop on the island. I knew where it was (on the back side of the big barn where the majority of the Carriage Tour horses are housed) and always stopped by there at the end of the season to take a photograph of the hundreds and hundreds of horseshoes stacked up outside the door. 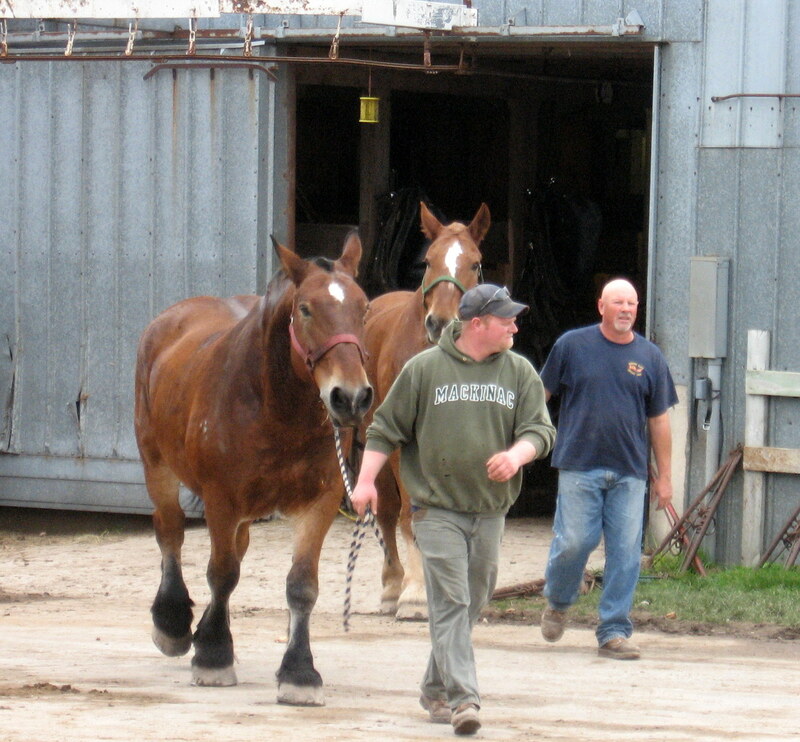 I watched as Eric and Keith (the blacksmiths) brought two horses out of the barn to have their shoes removed. These were two of the 36 which would be going to the winter pastures on Thursday. Their manes had already been shaved – so they don’t return in the spring with manes full of cockleburs. 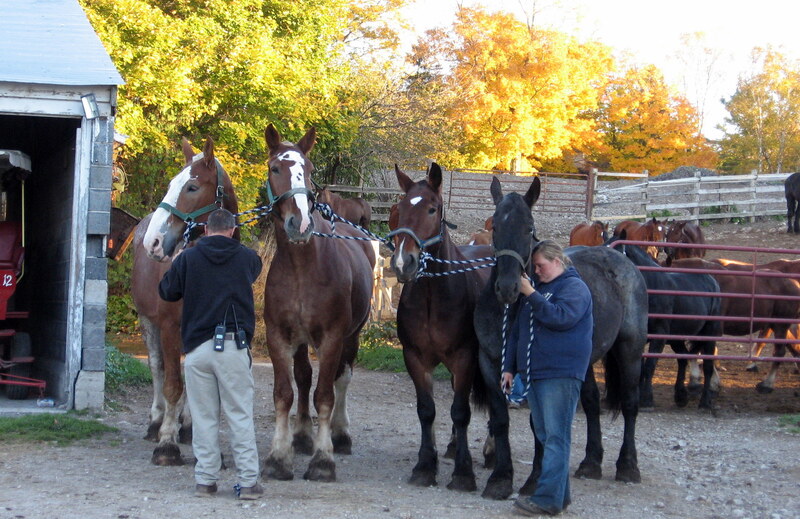 The haircut also ensures that the returning horses’ manes will all be the same length in the spring, giving the teams a more matched appearance. Keith is the head blacksmith. 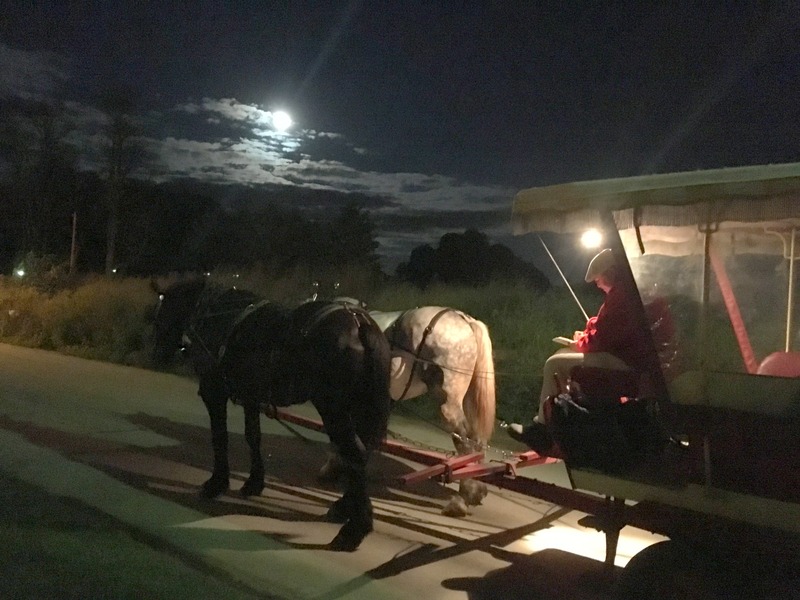 While he worked, he explained that most of the horses wear steel shoes on their back hoofs and rubber-over-steel on their front hoofs (to add traction on wet pavement). 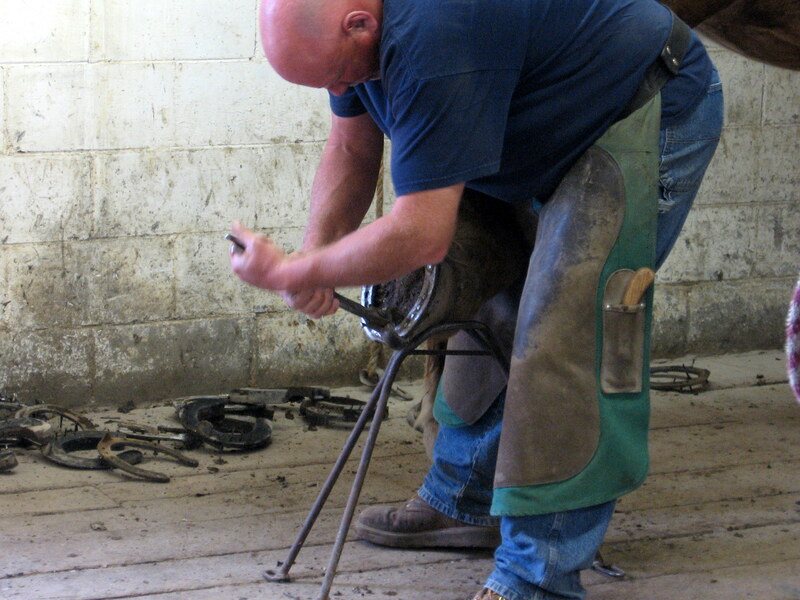 Removing the nails which keep the shoes on the horses’ hoofs (the process is completely painless, as is the shoeing itself) requires strength, balance, and the ability to keep the horse calm while the work is done. 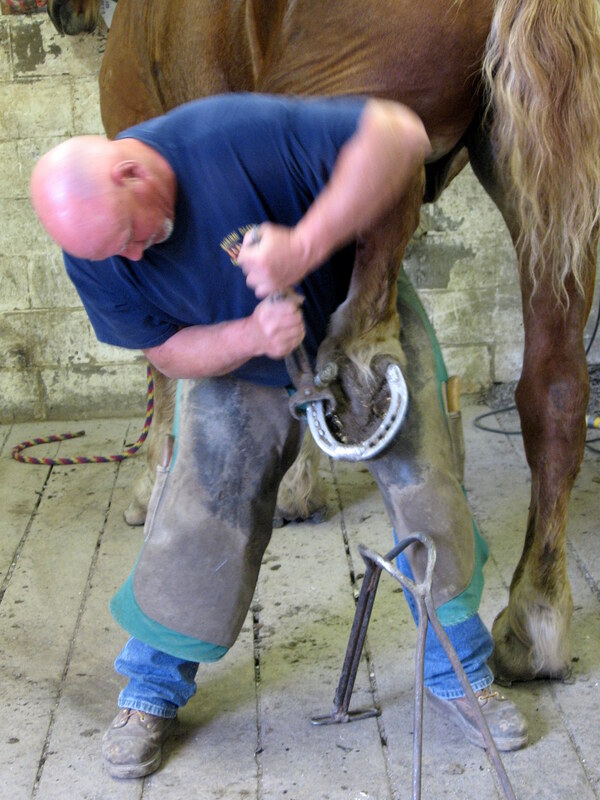 Sometimes a simple prop is used to anchor the foot while the shoe is removed . . .
. . . and sometimes the hoof rests on the blacksmith’s hip. Over 1,400 of the steel shoes and more than 3,000 rubber-over-steel shoes are used each season. At the end of the summer the shoes are transported off the island for disposal. 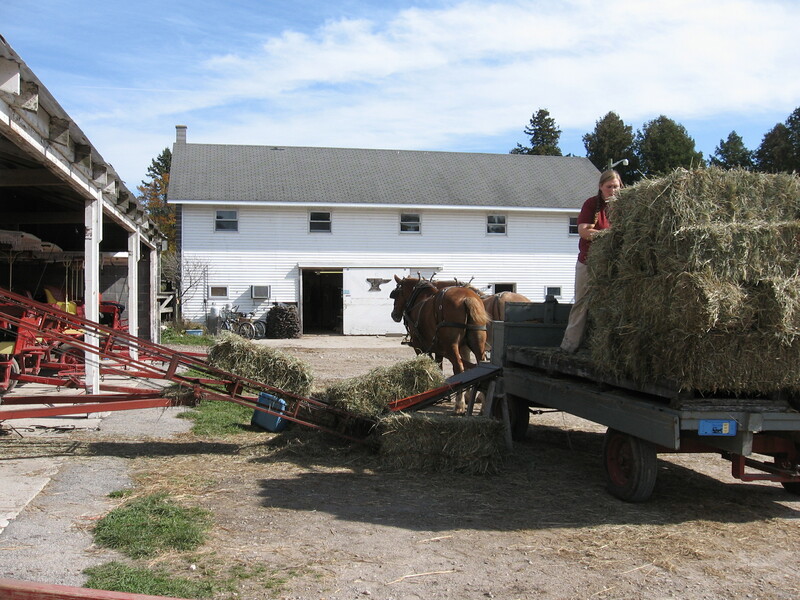 Hay wagons travel up Cadotte all the time, but I had never actually witnessed what happens to the hay when it arrives at a barn. Carriage Tour workers were unloading a hay wagon as I was leaving Wednesday afternoon, and I stopped to watch the process. 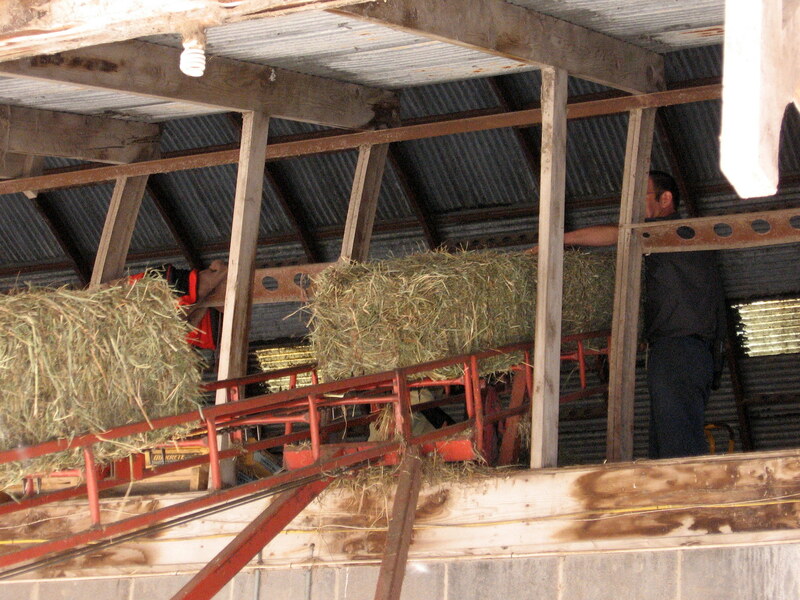 The bales are tossed onto an automated conveyor belt that carries each bale up into the hayloft of the barn. At the top of the belt, another worker is waiting to remove the bale and stack it in the loft. Ted set the alarm clock for 6:30 Thursday morning, and I grumbled myself awake. I needed to be at the barn (a five-minute walk from the condo) at 8 a.m. so I could watch the workers catch the horses in the corral. I figured an hour-and-a-half would be plenty of time to get myself awake enough to make sense when I got down there. Silly me. I’d forgotten how many months it’s been since I had to get up at 6:30 (almost 2 hours earlier than I’ve been getting up lately). I needed to wash my hair (don’t ask me why – I just felt like it needed to be washed) – which I did. I needed two cups of coffee so I wouldn’t growl at anyone (I made the coffee and didn’t have time to drink a drop). 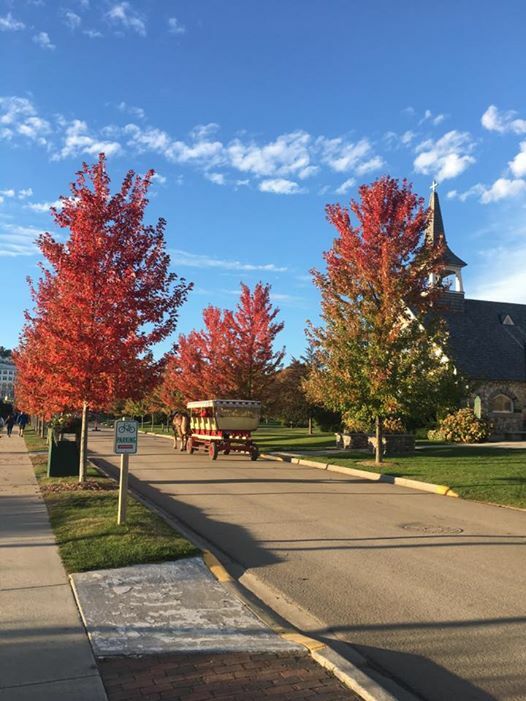 I couldn’t decide how many layers to wear (after checking the Weather Channel for Pickford – an hour north), I decided on three, saddling myself with two too many – it was a gorgeous northern Michigan Indian Summer day. 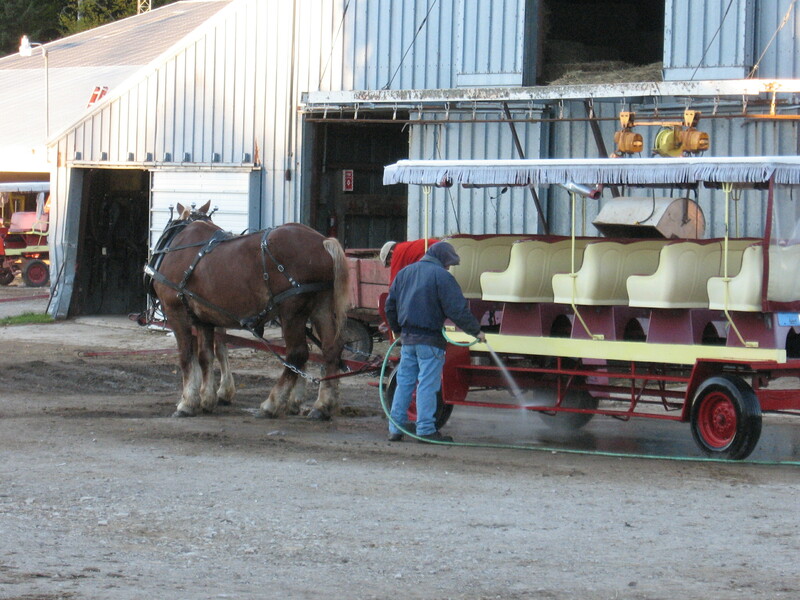 I left the condo at 7:50, and arrived at the barn to find taxi and Carriage Tour drivers busy washing and harnessing their horses for a regular day. 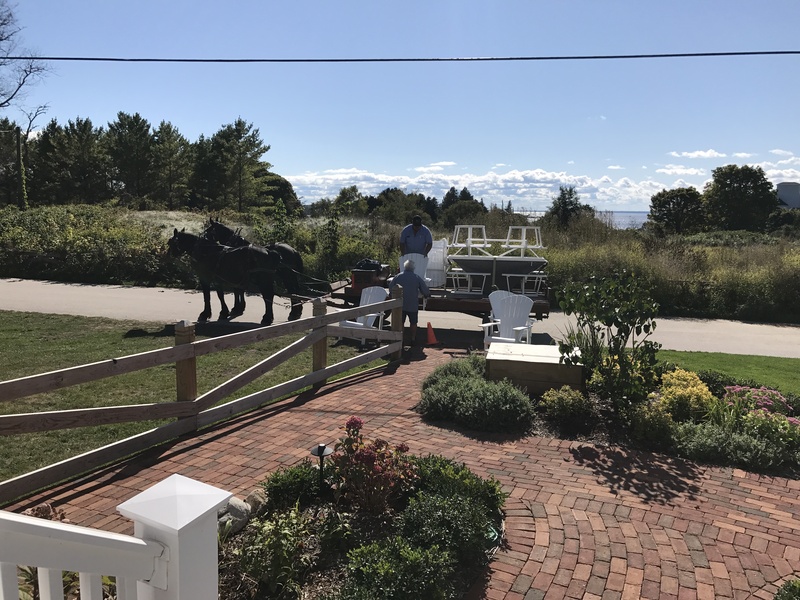 This two-horse hitch carriage was getting a quick rinse before pulling out for a day of transporting island visitors around the island. 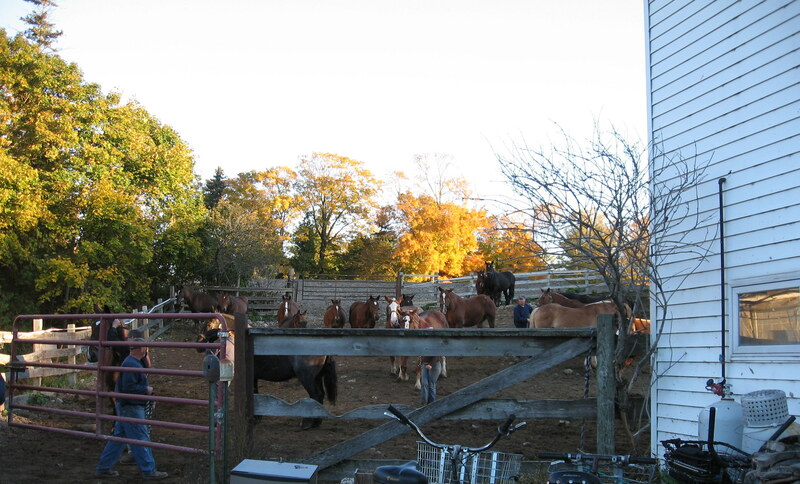 A few minutes later, Eric moved toward the corral, opened the gate, and he and several other barn workers began to catch the horses, bring them outside the corral, and group them into four’s. Denise, from the Carriage Museum, came down to take photos also and shared this one with me late this afternoon. That’s me with the backpack, standing around like I have no clue what’s going on while everyone else is busy, busy, busy. 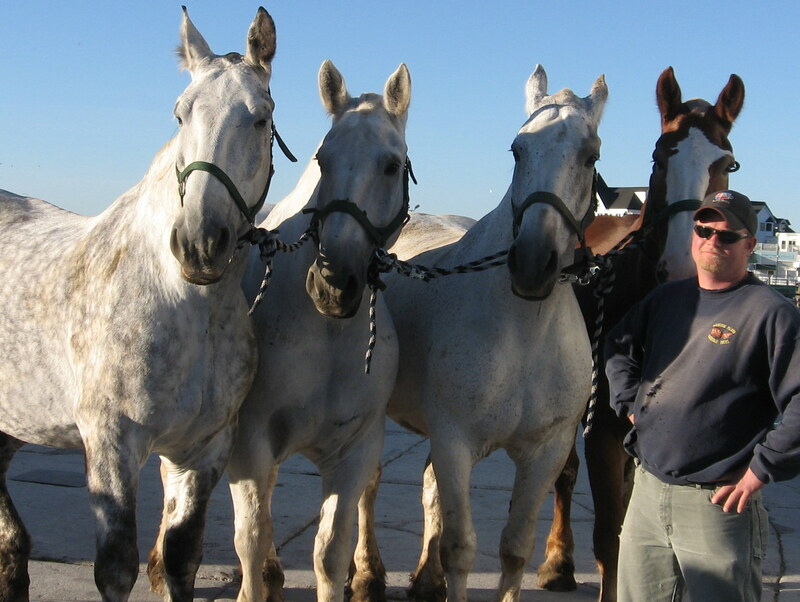 We’d be transporting three groups of four horses this first trip. 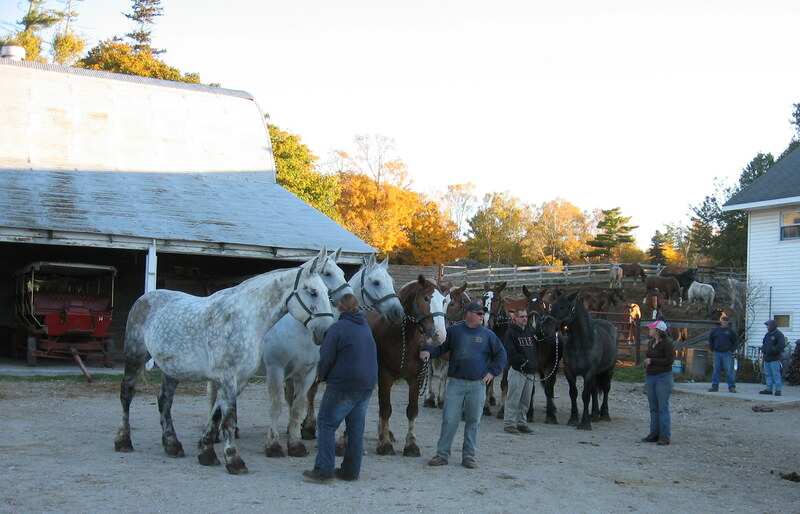 All the horses going today were either Belgians (all shades of brown) or Percherons (usually black, grey, white, or dappled). 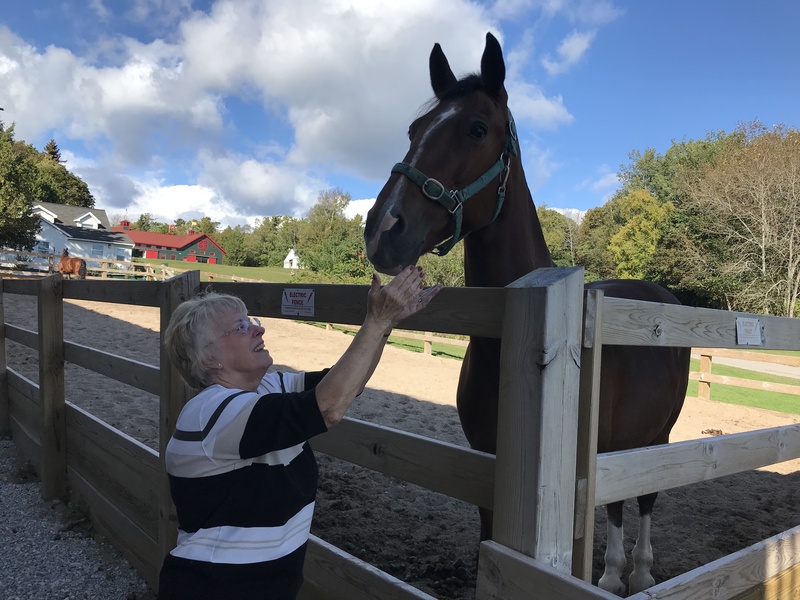 “Jane” is a new horse this year. Because of that, she had her picture made before going off the island. 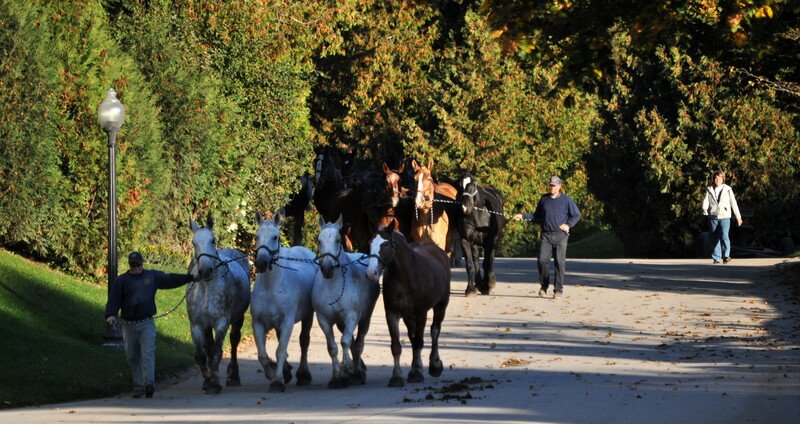 It will be put into a computer file which stores “mug shots” of each horse owned by Carriage Tours. That’s Jim holding Jane’s nametag. 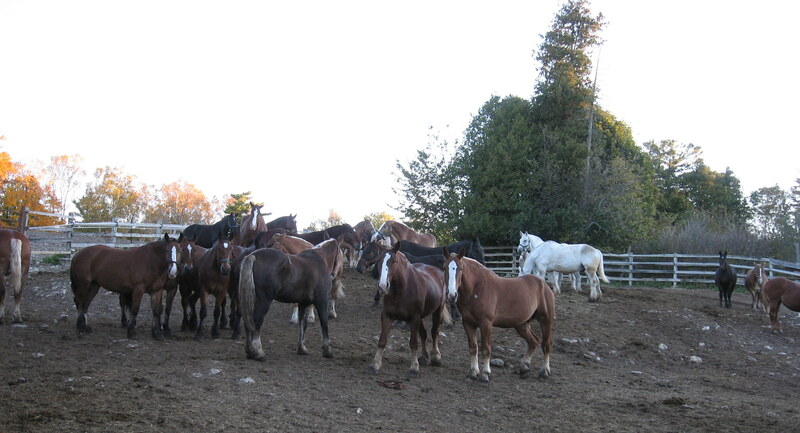 Once the horses were grouped, everything started moving really fast. I instantly knew I had really messed up by not riding my bike. When these guys take off to walk down a hill, they don’t think “leisurely stroll”. I started off ahead of them and was soon ridiculously behind. 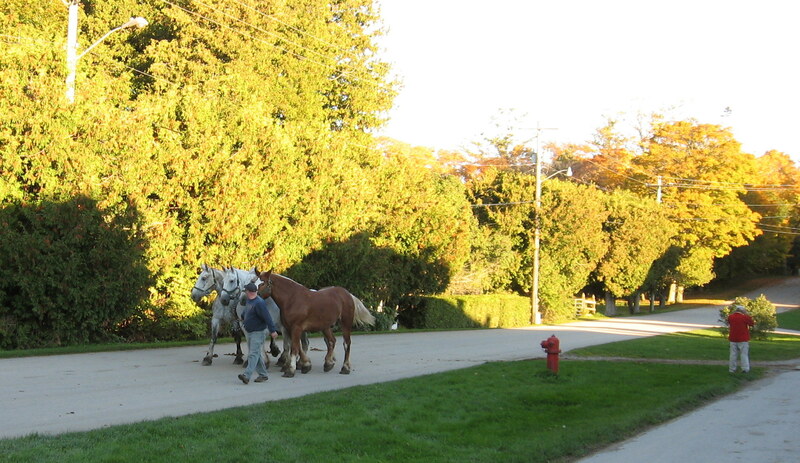 It was a wonderful morning on the island, and the horses seemed to sense that this was no ordinary walk around the block. I’m sure the pavement must have felt very different to their feet without their shoes – maybe like that first barefoot day of summer right after school is out. At Four Corners I knew I was about to lose this footrace. I started out ahead of the first group, and now was being overtaken by the last two groups. This is another Denise photo (thank goodness!). 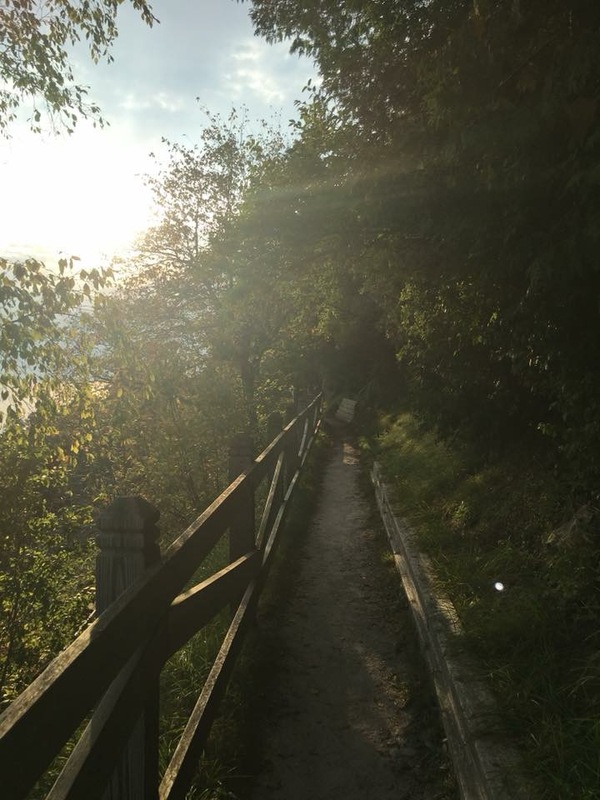 And yes, that’s yours truly huffing down the hill on the right – now firmly in last place. 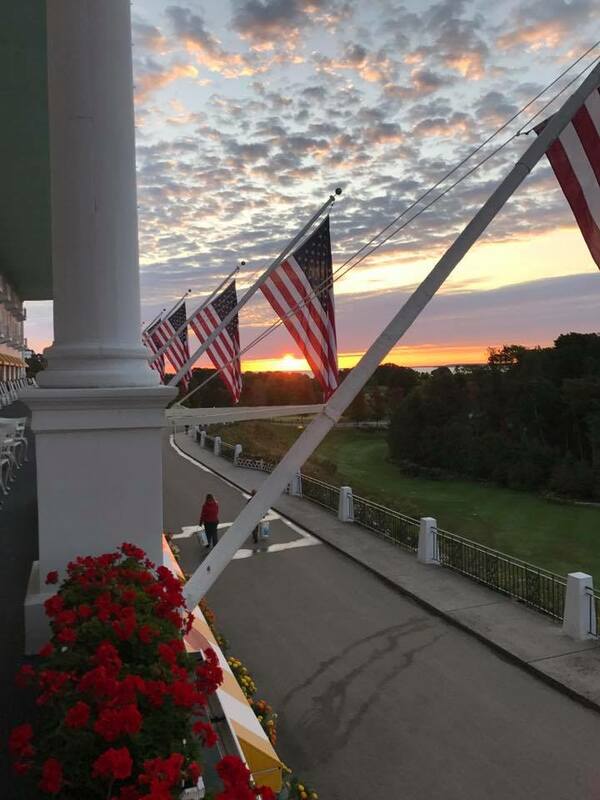 A great photo from Denise as one group passes the Grand Hotel. They are really beginning to feel frisky now! I took this one from behind (where I stayed for the rest of the trip down the hill). 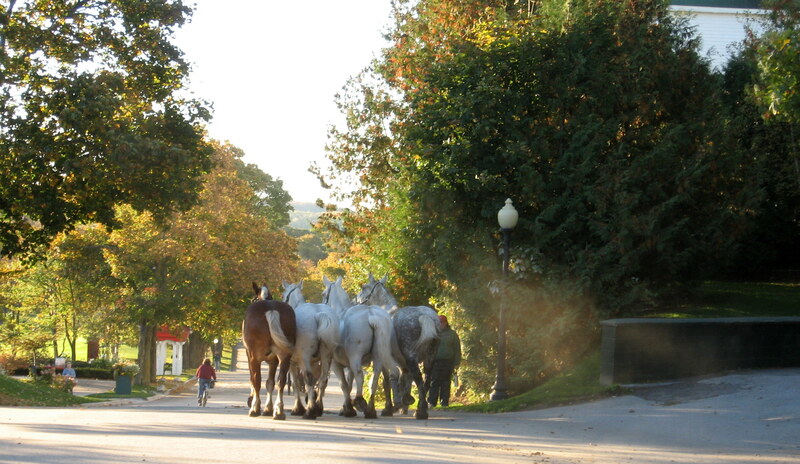 The horses on Market Street (a Jill photo). I had just turned onto Market and was crossing behind them to Main Street. That’s Frankie and Hershey on the sidewalk. 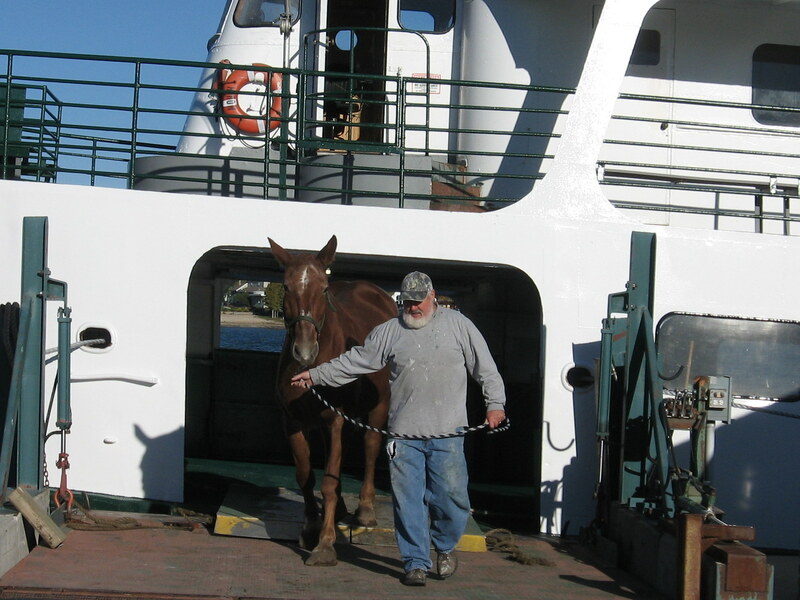 I arrived at the ferry dock a good 10 minutes after the horses, and thank goodness we had left the barns early. 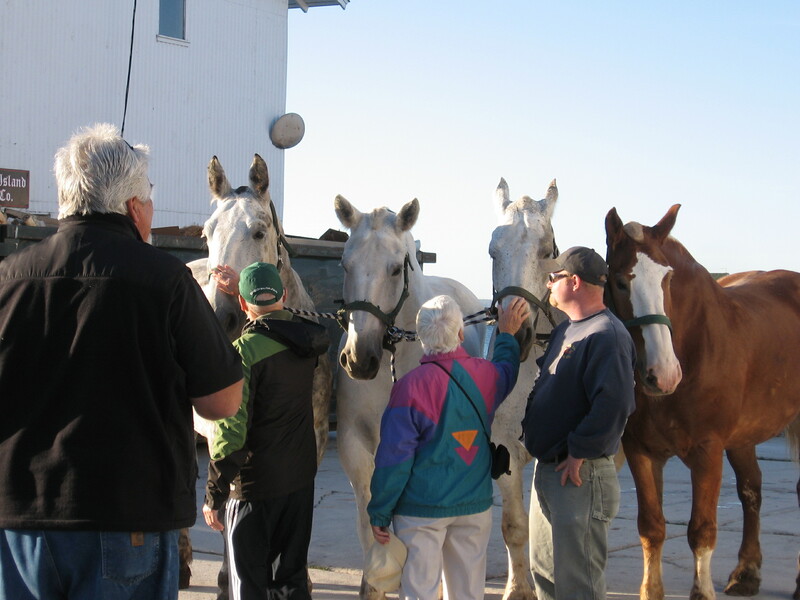 A crowd had formed on the dock (as it always does when word that “horses are coming” sweeps through downtown). Visitors are awed by getting up close to these gentle giants and love to pet them and snap photos. 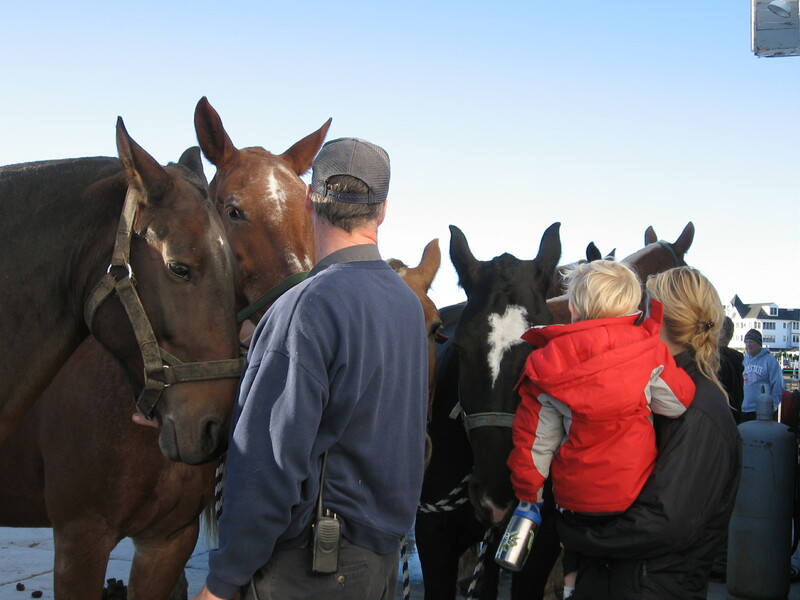 This little boy had lots of questions about the “horseys” and wanted to touch them – as long as Mom touched them first. 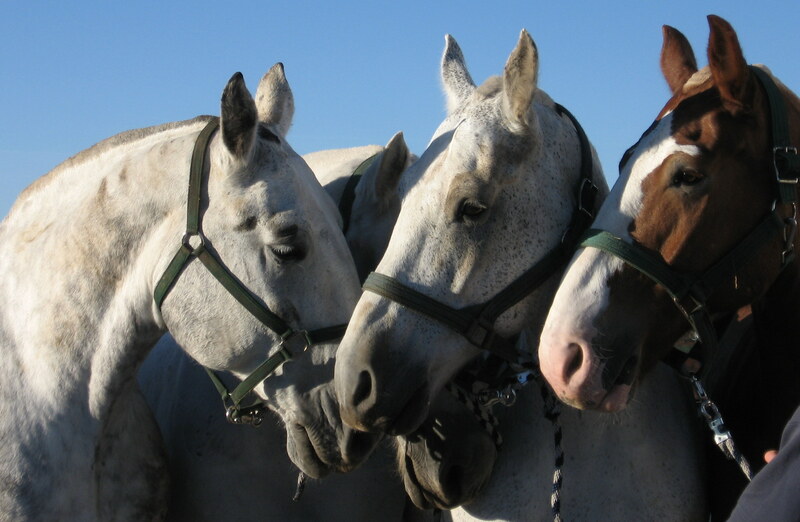 As much as I’ve been around horses and their drivers for the last three years, I’m still always amazed at how the workers seem to know the names and temperaments of each and every horse – and I’m talking over 400 of these four-legged wonders. In this photo, Eric was talking to a small crowd that had gathered about the likes and dislikes of each of these four. 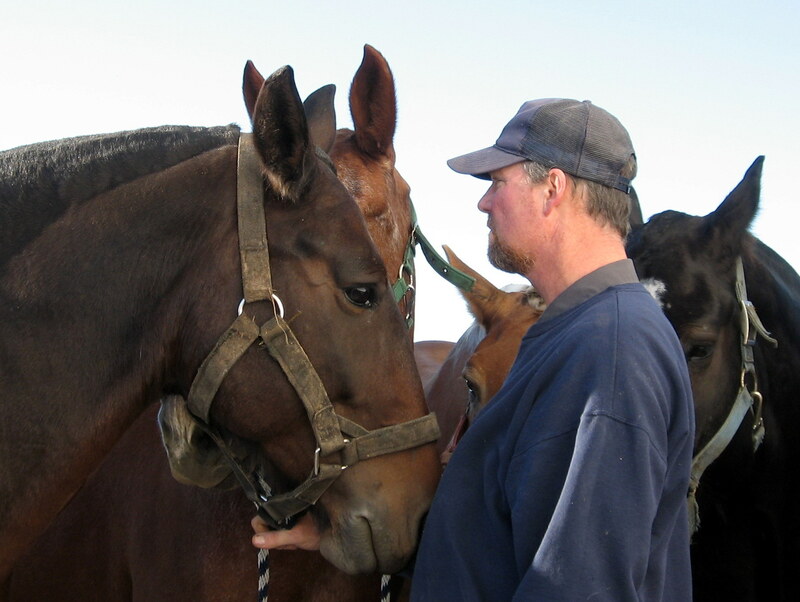 And then there’s the obvious love the workers have for these animals – and that love is returned full measure by the horses. Watching them say goodbye always gets me teary-eyed. Don’t know if I could handle doing it several times a week as they do this time of year. 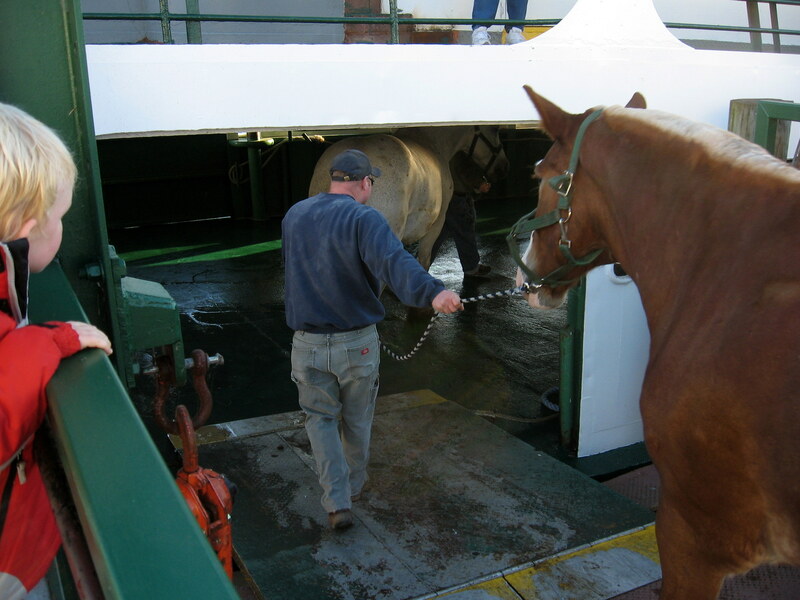 Loading time finally arrived, and the first group was separated and led into the ferry – one by one. The last group boarded, and I asked if I could go inside on the horse level to take photos. No worries – but they did suggest I might want to take the photos, then go topside for the trip over. 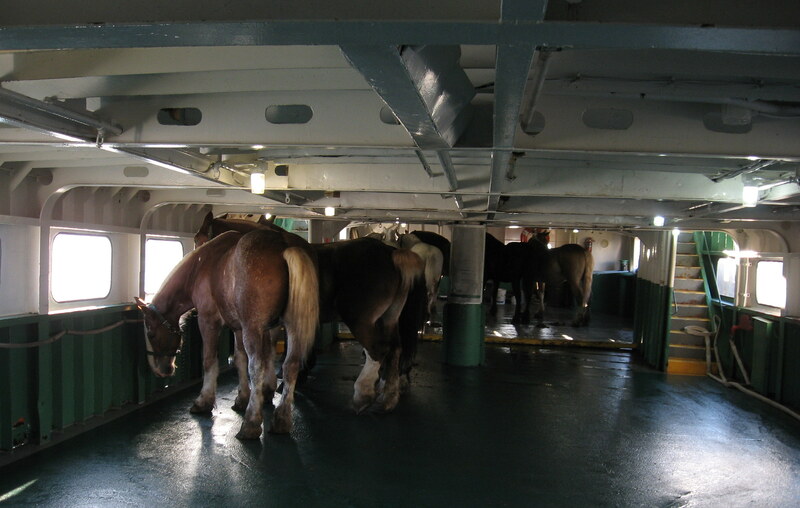 The horses are all tied individually at the rear of the ferry. Most have made the trip so often they take it all in stride. The Huron is a lot different from the catamaran we’re used to riding. 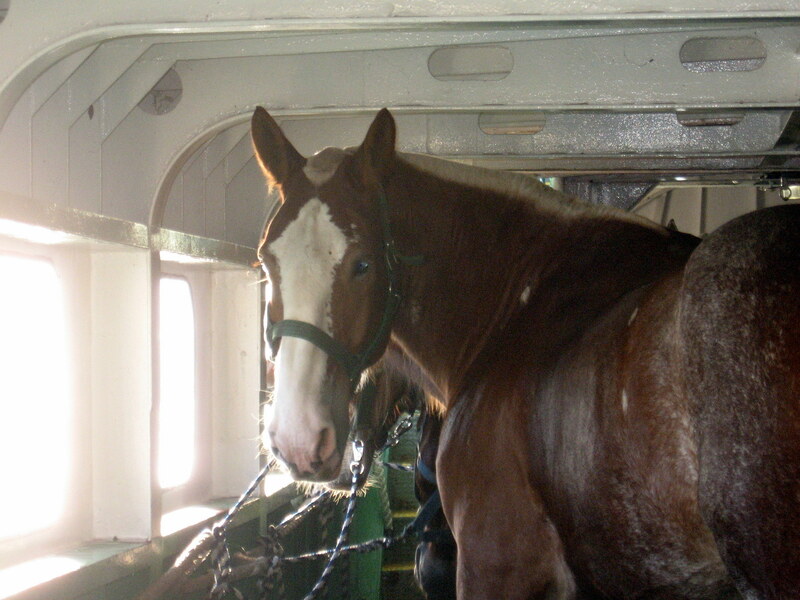 It’s main purpose is to transport freight of all descriptions (including horses) back and forth across the Straits. 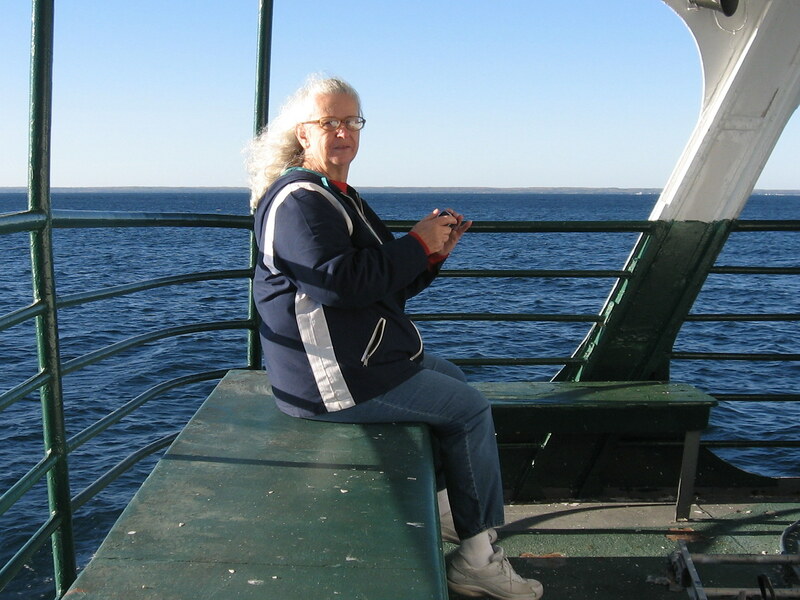 The only other “civilian” on the boat was Tarry, who works with the St. Ignace Chamber of Commerce. She had crossed with the horses many times and had all kinds of good suggestions for photos. 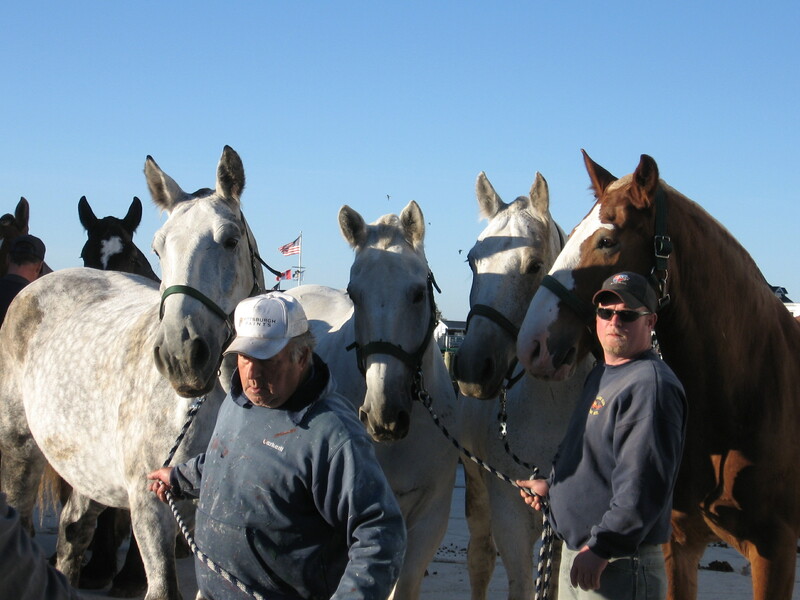 The horses made the trip just fine. 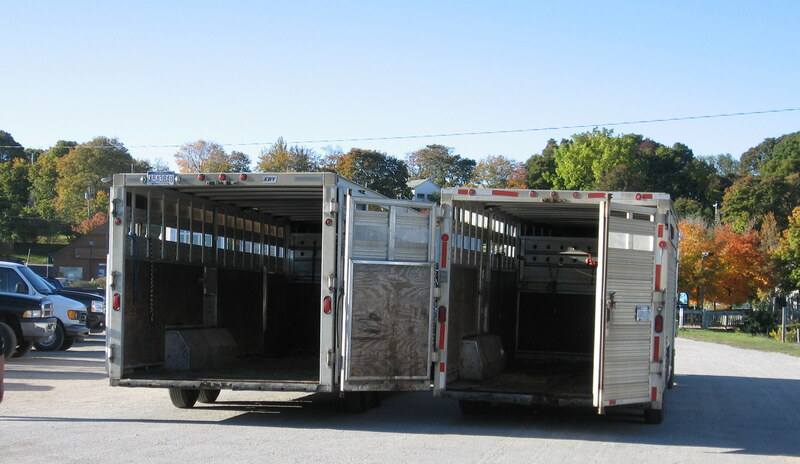 Next step to freedom – a trip down the gangplank . . .
. . . then a step up into the horse trailers. 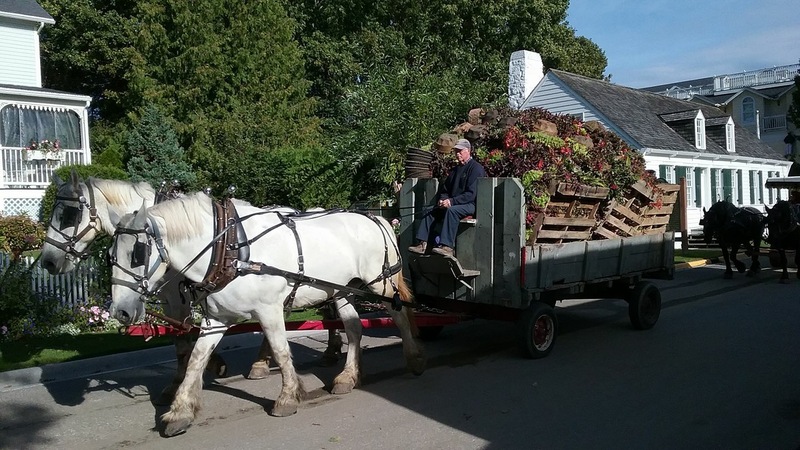 On Sunday, we’ll travel to Pickford and watch the horses unload into what – to them – must feel like Heaven on earth. You will love it! Have a great weekend, and God bless. Personal Note: I loved reading back over this blog, first published October 31, 2009. Some of the businesses listed in this post are no longer open, and restaurants open all winter have changed since 2009. 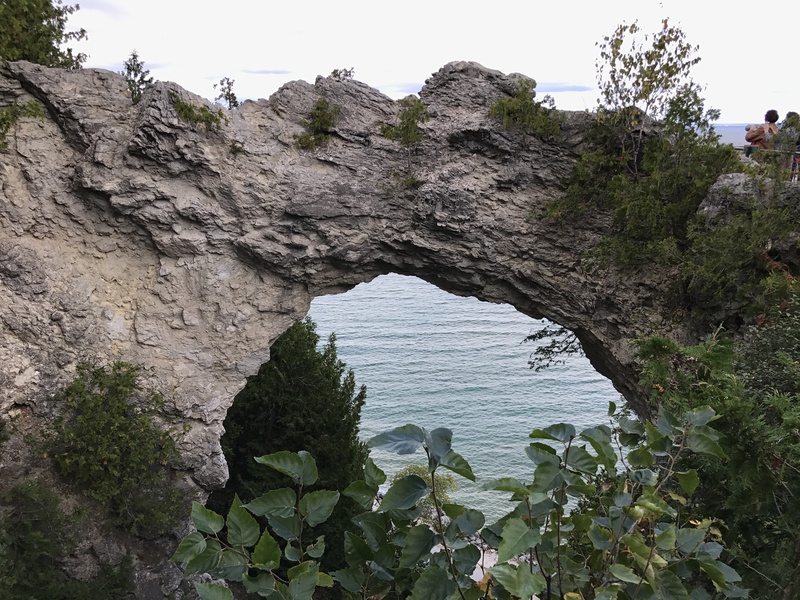 So please remember, if you’re planning a winter trip to Mackinac THIS (2017-18) winter, you need to check what’s open and what’s not! 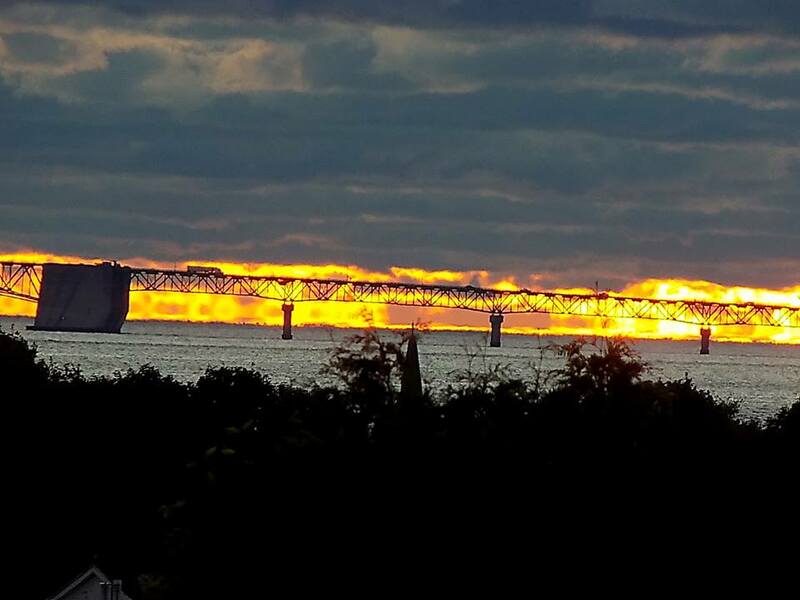 Header Photo by Jill Sawatzki. 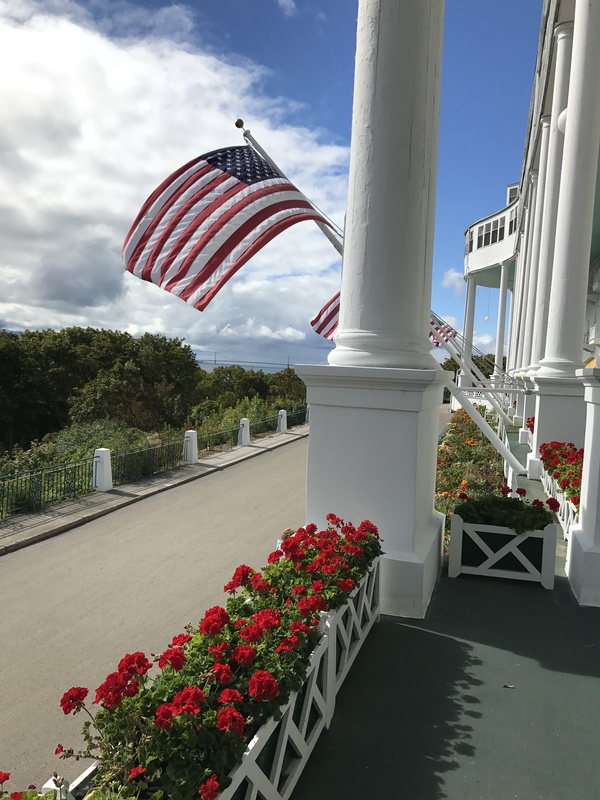 Today I want to share with you some pictures I’ve been taking this week as the “town” of Mackinac Island slowly closes its doors to all but the winter residents (around 500) and the few hundred tourists who come over during the winter to snowmobile and cross-country ski. Yes, there are a few businesses still open. 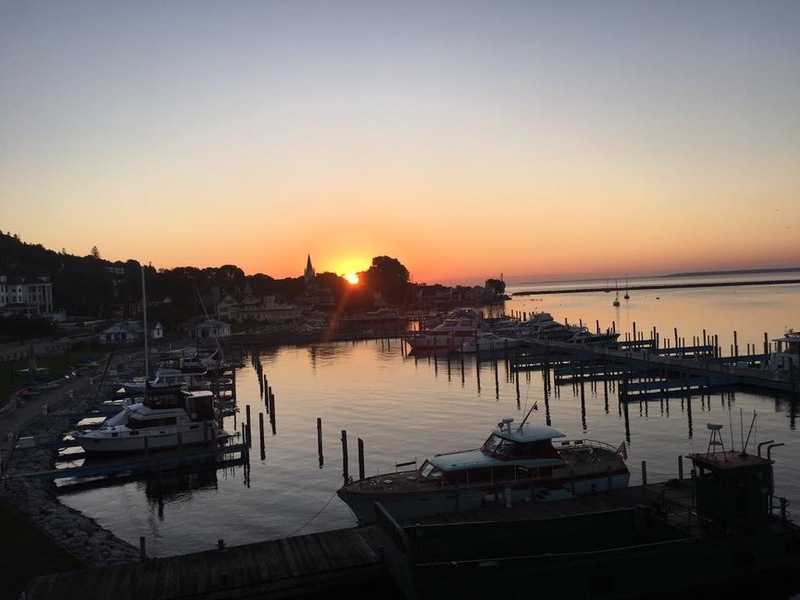 The city offices are here and working all year – the island still has to have lights and water and garbage pickup. 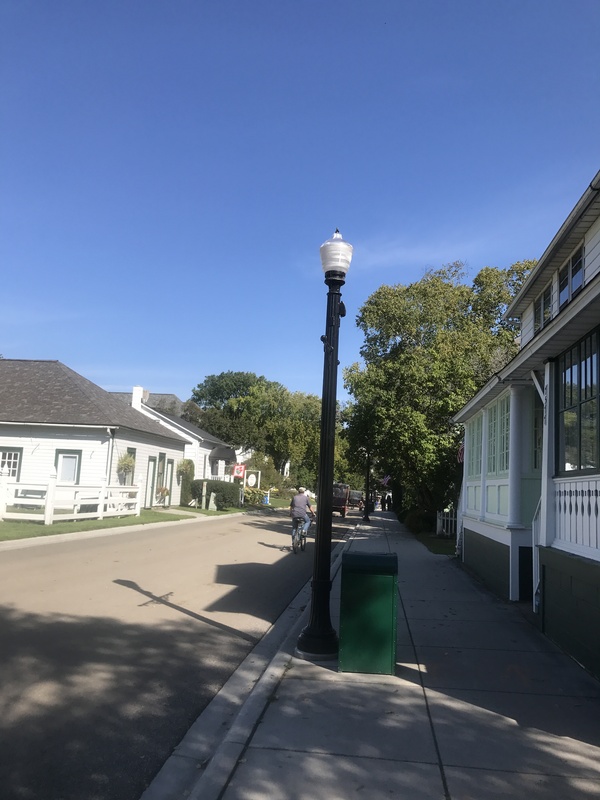 The public school is open year-round, as is Doud’s Market and Alford’s Drug Store. The Village Inn will be open all winter, except for two weeks at the end of November (hunting season!). The Mustang never closes, nor does Sinclair’s Irish Pub. 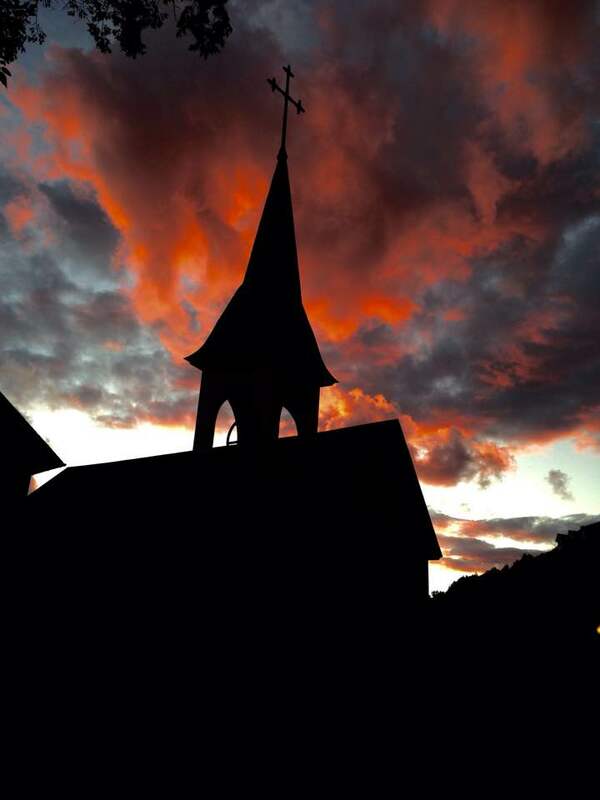 St. Anne’s Catholic Church becomes the social hub of the entire community now, regardless of church affiliation. I noticed, even before the last Grand employee had left the island, businesses had begun maintenance work for next spring. One of the fudge shops was getting a new tile floor, another was getting new paint. The islanders stay as busy as possible with outdoor work right up until that first heavy snowfall stops all the activity in its tracks. Maintenance will continue indoors on some businesses until the cost of heating shuts everything down until spring. La Galerie’s display windows, completely bare. The doors have special slanted mats in front of them to prevent melting snow from getting into the shop. The sign on Goodfellow’s door. Two empty shops on Main Street. Shepler’s Ferry Dock – no boats, no people. 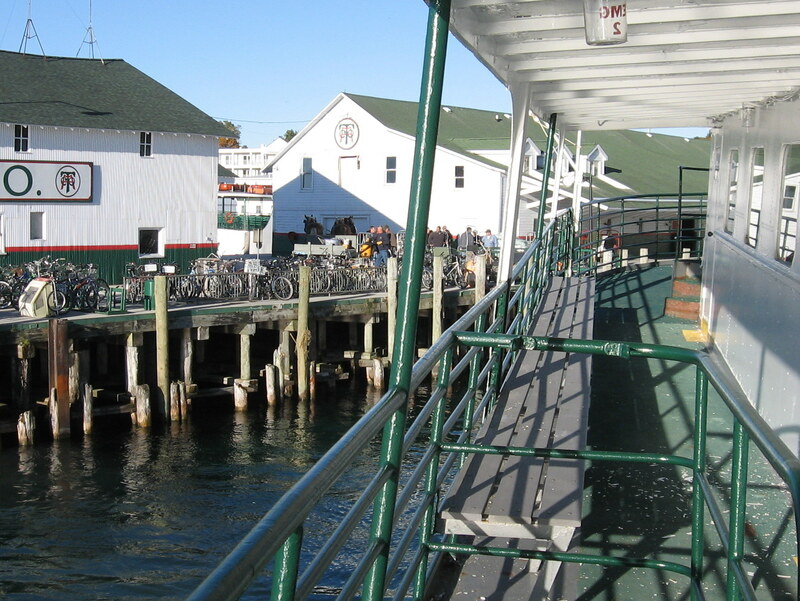 These workers were carrying the awnings from the Mackinac Island Bike Shop somewhere to put in storage. All the stores with awnings do the same thing. That’s easier that having to replace all those awnings that heavy snow would have broken during the winter. 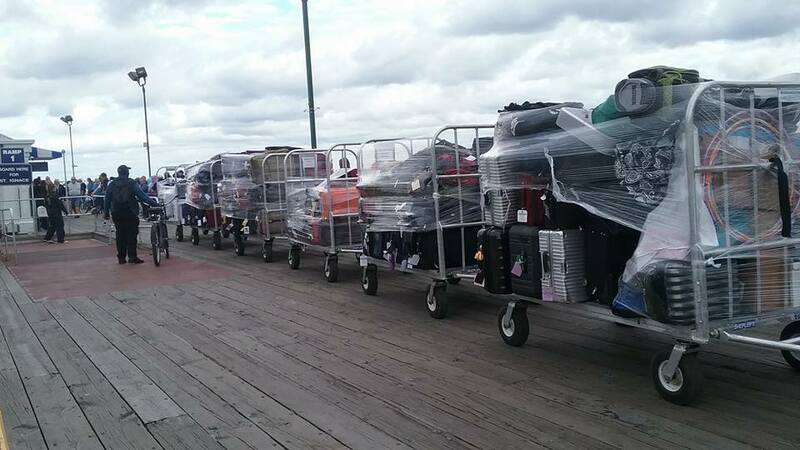 Luggage carts from the ferry docks going to storage. Decked Out, a very nice clothing store, empty and locked. Murdick’s Fudge, getting a new coat of paint before the snow falls. The lobby of the Chippewa Hotel. The Pink Pony – two nights before this photo was taken, it was full of costume-clad goblins. Sweet Anna. I finally got to photograph her somewhere besides in front of the Grand shoveling up horse poop. 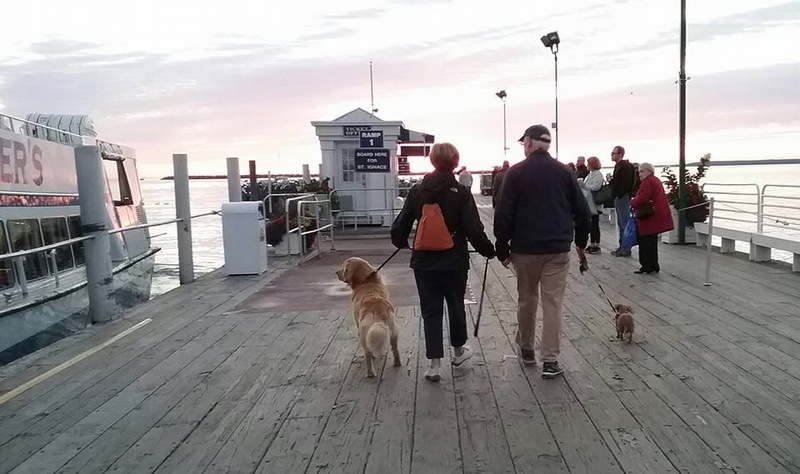 She was leaving the island, on her way back to college. Jill took this shot early one morning this week, before she left. It’s boxes and boxes of empty beer bottles, waiting to be picked up for recycling. Empty Main Street – Wednesday morning. The other end of Main Street. A new shop – opening in the spring! 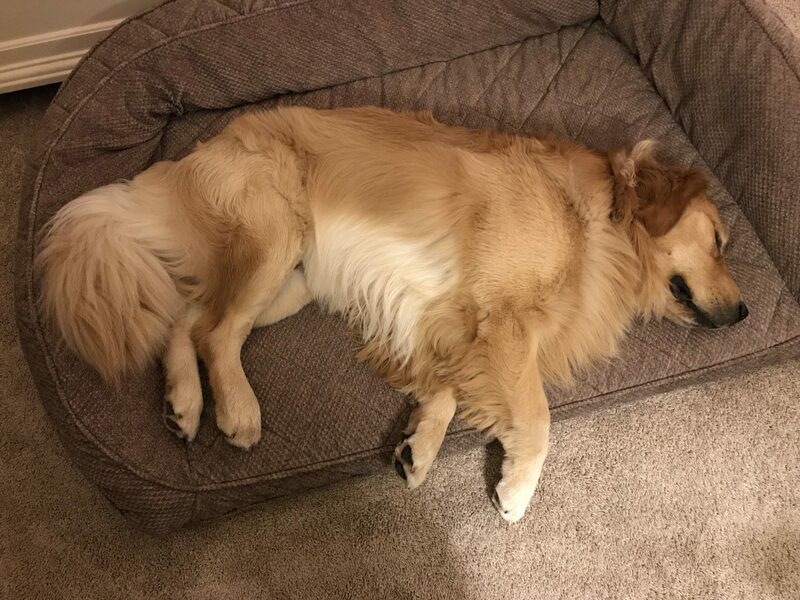 It’s now Friday night – around 10:45 p.m. Ted and I have just gotten back from our date night. About an hour before we started to town, the rain started again. There are no taxis running after five o’clock now unless you have reserved one in advance. We didn’t. So we put on all our rain gear and started down the hill. We laughted as we walked, saying that back home in Georgia, we probably wouldn’t even venture out in our car on a night like tonight – we certainly wouldn’t think of putting on rain gear and walking somewhere. Yet, here we were, splashing through puddles with rain blowing in our face- and laughing about it! We ate dinner at the Village Inn, and about 10 minutes before we were leaving, the wind started blowing like crazy. We walked up the hill with Ted holding on to me so I wouldn’t be blown away. That stretch of Cadotte behind the school where there are no trees to block the winds off Lake Huron is the worst, but we got home ok. So the last Friday in the month played itself out as the other Fridays in October did – with crazy weather. Downtown tonight – just as we got into town, the rain stopped. The Village Inn tonight. They have placed a pool table in the middle of the floor where about 10 dinner tables were this summer. On the way up the hill tonight, we stepped into the little entrance gazebo of the Jockey Club to get a little protection from the wind for a minute. Behind Ted you can see a snow fence. It has been placed all along Cadotte bordering the Grand’s property. It will prevent snowmobiles from crossing onto the golf course. Time to go to bed. We got a lot of packing done today – tomorrow we clean. Sunday we leave. Sometime tomorrow I will sit down and write the last blog of the season. I can’t believe that day is finally here. I just can’t believe it. The Hortons have been back in Florida for almost a week now. The bags are all unpacked, the dirty clothes from the road trip are washed, and I’ve pressed all the clean stuff that came home in the luggage and just couldn’t be worn until the travel wrinkles were removed. We are glad to be home. I love our house here. 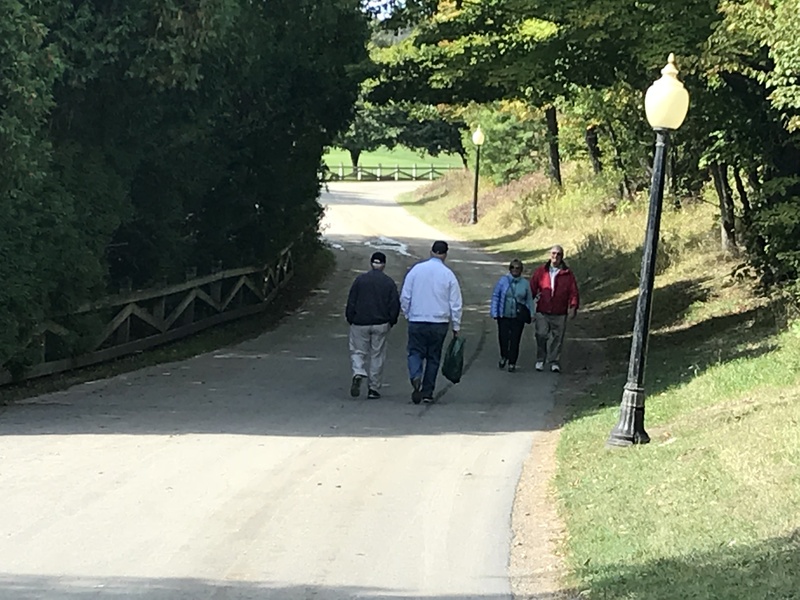 And I love our neighborhood, our friends, and knowing Julie and Matt and the grandkids are just a 20-minute ride down the road. Before we head back to Mackinac next summer, our beautiful Jordan will graduate from high school. How can that possibly be? Jordan and Matthew on Homecoming night. 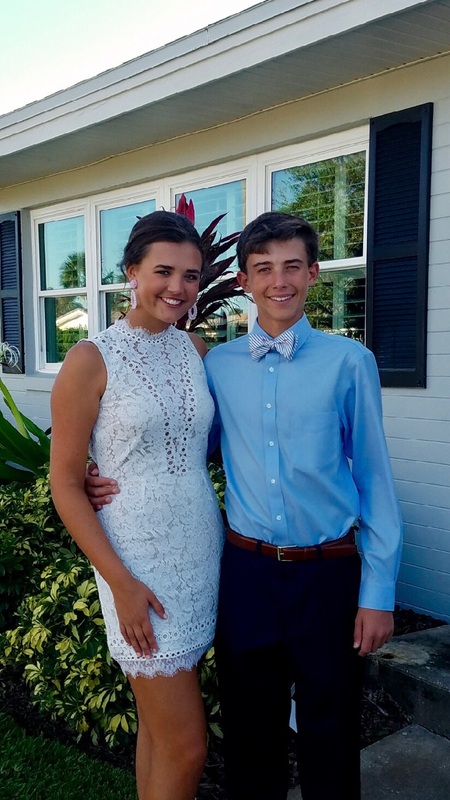 It was Jordan’s last Homecoming before she graduates and Matthew’s first as a Freshman this year. Our trip home was different this year. We went a different route because Jason’s house in Atlanta is still being reconstructed after Irma dropped two trees on top of it. We saw some different scenery, but we kind of missed the “tried and true” routine of our normal route. I think we were most disappointed that the fall leaves were just not yet in full splendor in the mountains. 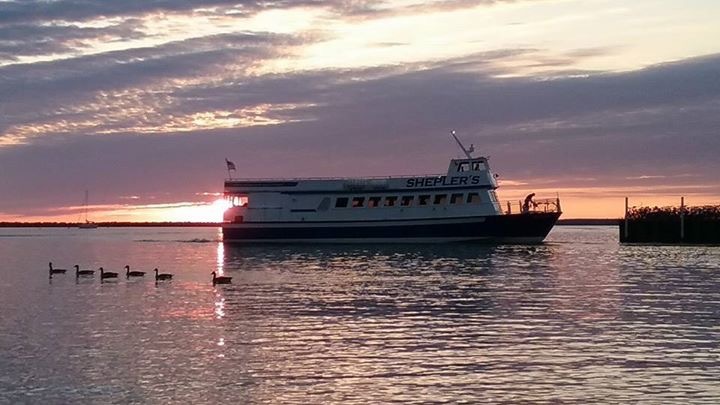 Jill captured our early morning departure from Shepler’s dock . . .
. . . . and our departing ferry. What a beautiful sunrise that day! We loved West Virginia. 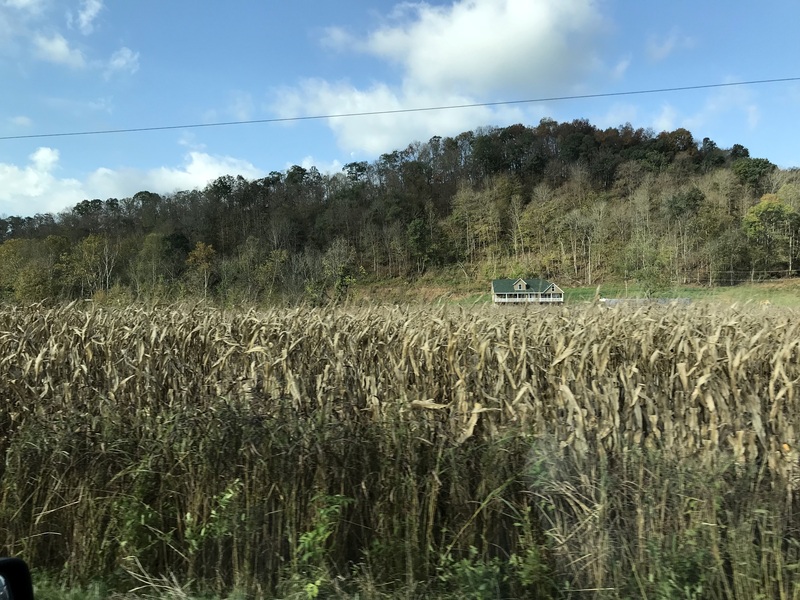 It reminded us a lot of the farmland in Georgia . . .
. . . . except there were more hills! 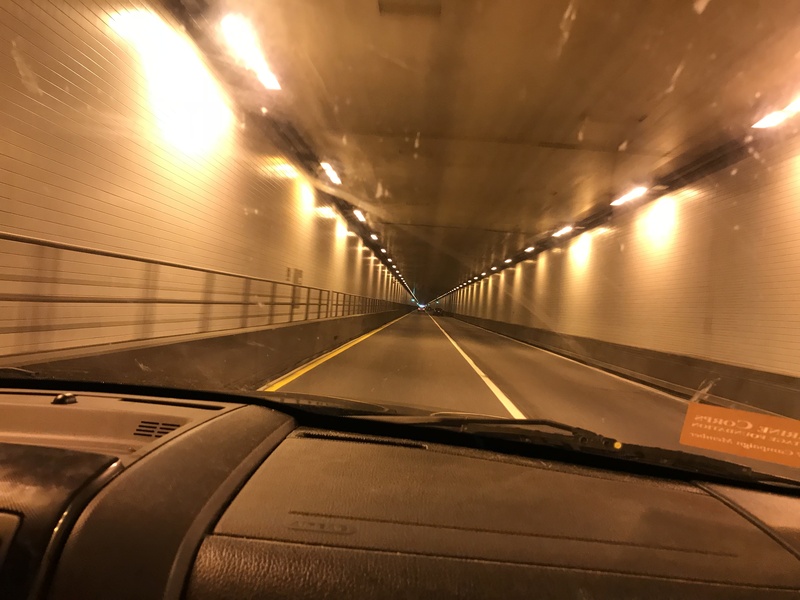 We crossed into Virginia through a tunnel through a mountain . 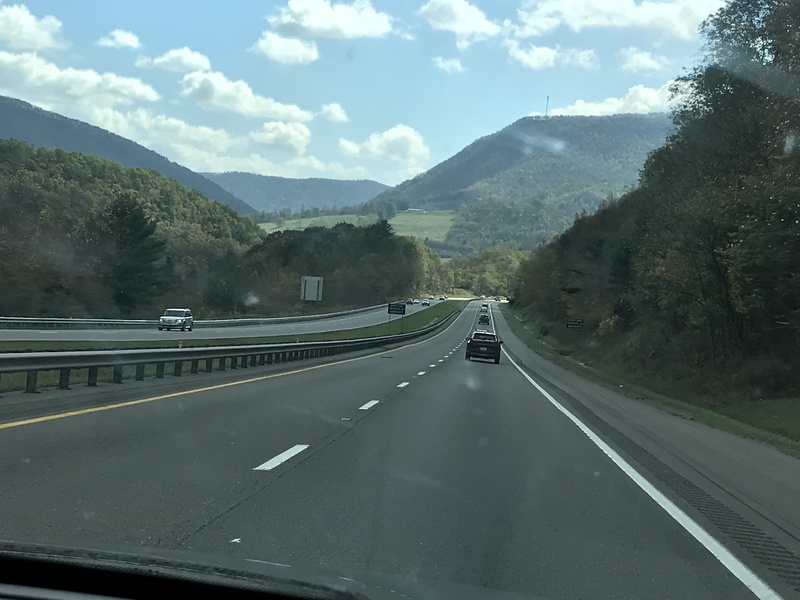 . .
. . . . and enjoyed some spectacular mountains vistas through that state as well as North and South Carolina. But the colors – they just weren’t there yet. The sunset from our deck our first night back was beautiful . . .
. . . . and dinner out the next evening with some of our neighbors made us feel like we’d finally arrived home. 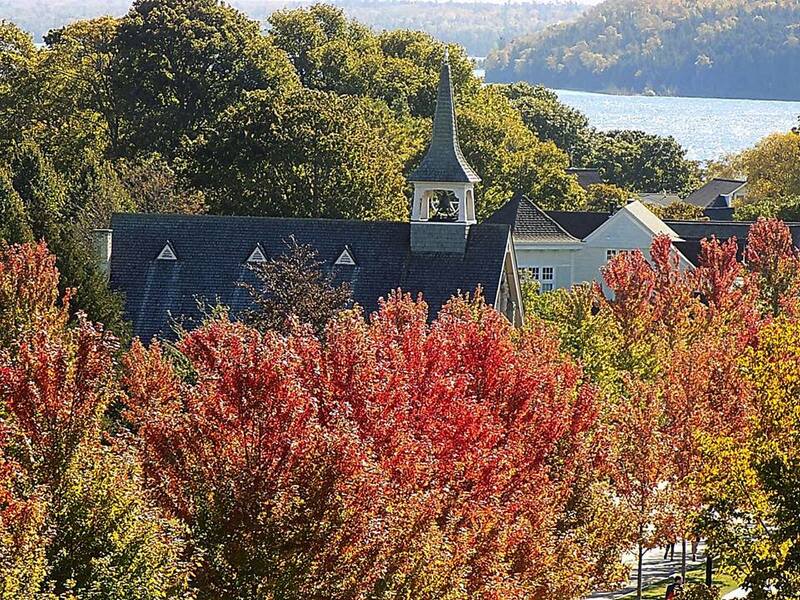 In the week we’ve been gone, Mackinac Island has been dressing for Fall in a big way and showing off as only Mackinac can! Dinner out our first night back at Breakaway’s. 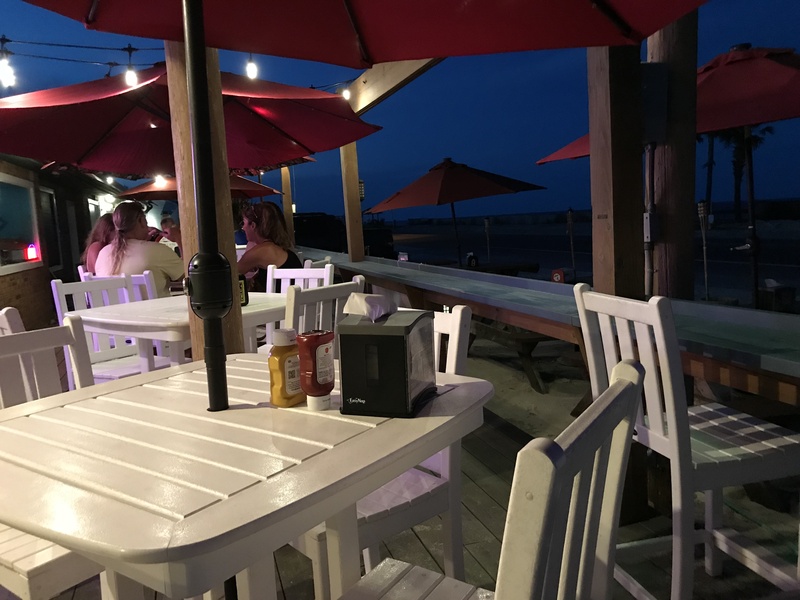 Eating outside right across the street from the Atlantic . 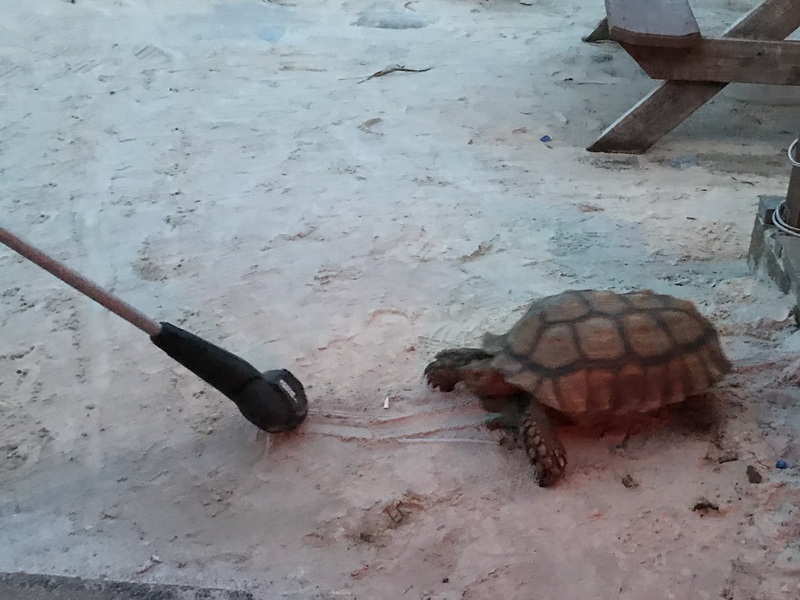 . .
. . . . and watching a lady lead her pet turtle around with a weed eater. I kid you not. 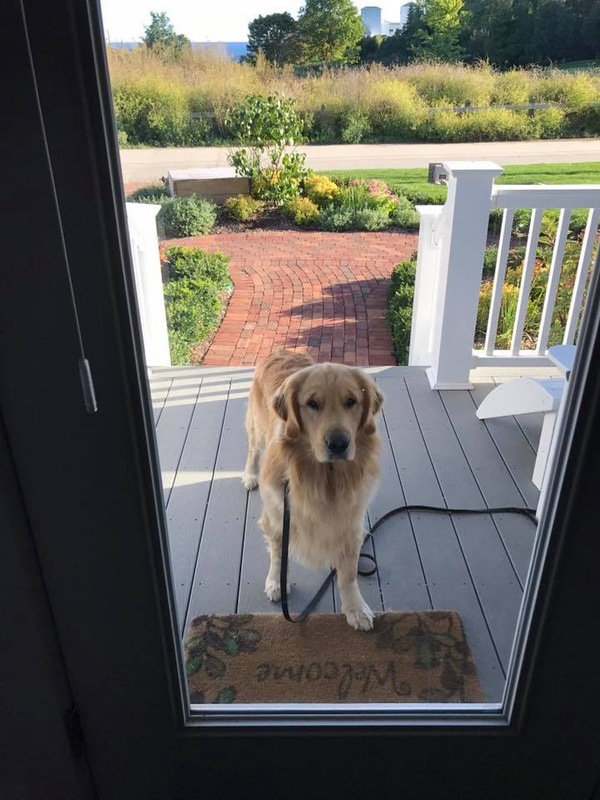 She says she takes him for a walk about once a month by cutting the grass with the weed eater. He will follow her anywhere – lured by the sweet grass smell! She walked off down the sidewalk with him following right behind her. There’s been a few days of rough ferry rides since we left. 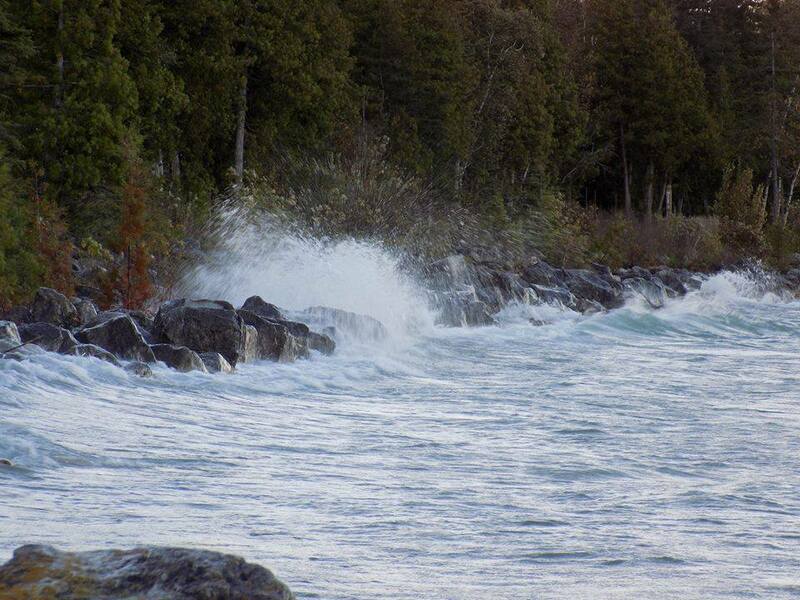 Jim Mishler captured waves crashing on the Mackinac shore during one storm. 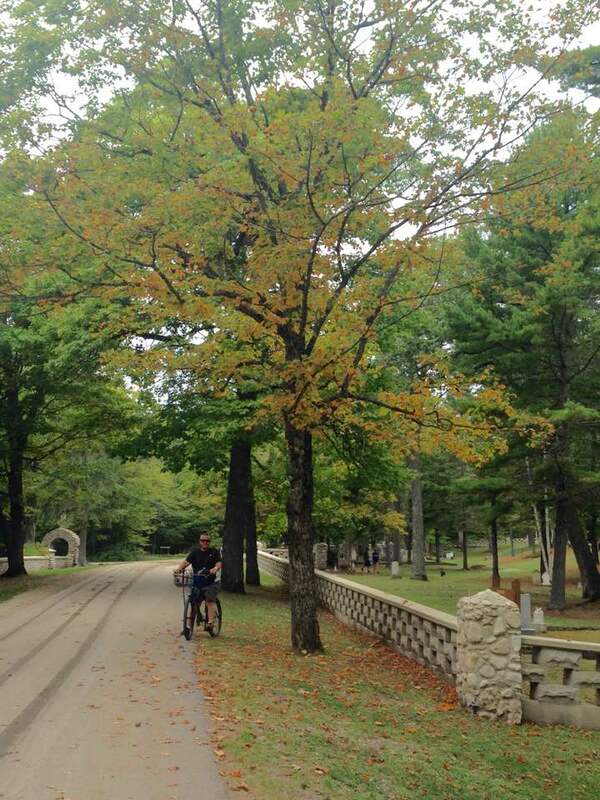 One of my favorite spots to leaf peek – Mackinac Island cemeteries. (Photo: Pam Day – Ohio) That’s Pam’s husband Mike on the bike. 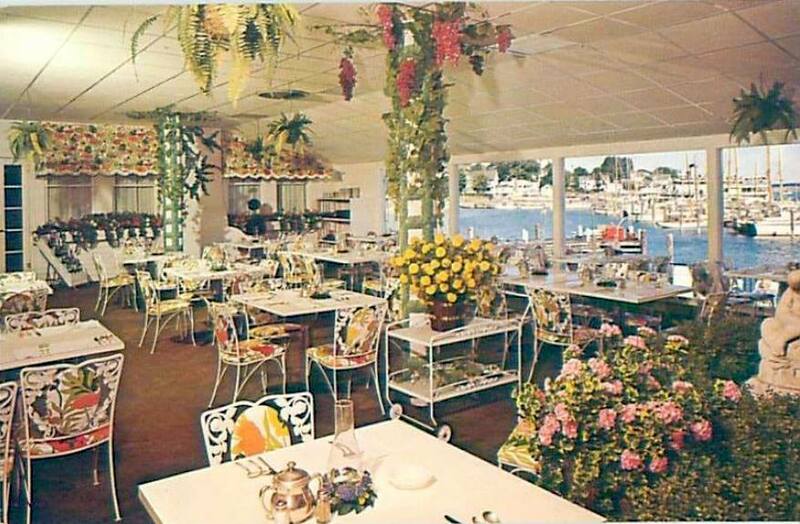 A vintage postcard, discovered by Roger Priebe, of the Chippewa Hotel Restaurant in the late 60’s. A good question – and one I’ll be thinking about a lot between now and the end of the year – and have been thinking about most of the summer. Until then, I’m going to take a break from writing, but I’ll be back here at least once a week with some of my earlier posts. Everyone seems to enjoy those, and I’ve sure got plenty to share. So, stay tuned for Throwback Thursdays! And, of course, you can always keep up with us on Facebook! You all continue to be a source of great happiness for me, and I love each and every one of you. You can’t imagine what it means to me to have you in my life. I just got my laptop unpacked and booted up and wanted to write a note to let those of you who aren’t on Facebook know we made it home – safe and sound – on Monday afternoon. I’ll write more about our trip in a few days, and I’ve got some great pics from the island that a friend shared over the last few days. For now just know we felt your travel prayers riding with us all three days of our journey home. We are so blessed to have friends like you! More soon . . . . . God bless. 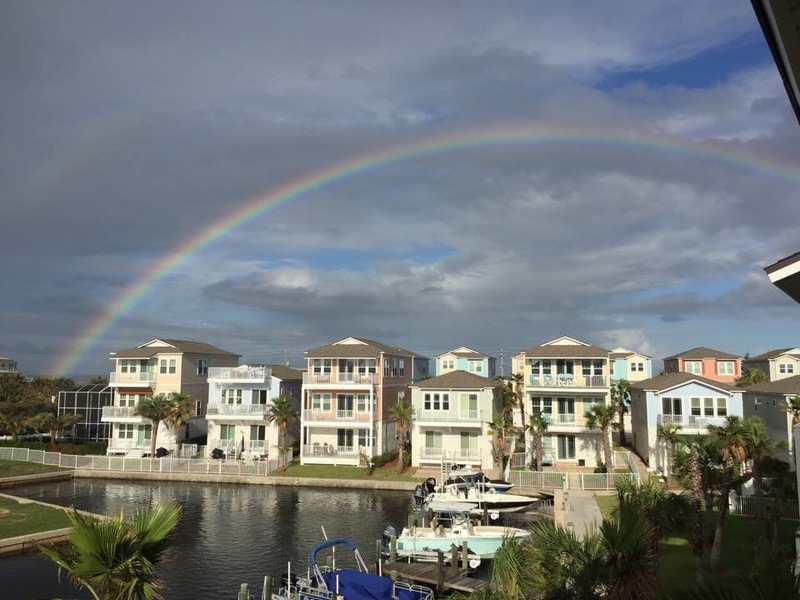 Home Sweet Home – from our deck this afternoon. The bags are packed. Ted took more than half our stuff over to the truck this morning and started the process of arranging it so we can once again get back home with everything we brought with us. That part never seems to get easier. I’ve got the last laundry load going, and anything that gets worn from this point on won’t get washed until we’re back at home in the sunshine state. All that’s left to do is go out to eat this evening, try and get some sleep ,and be ready when the taxi arrives at 7:15 Saturday morning so we can make the 8 o’clock ferry. I can’t believe it’s time to go. I thought I’d post a few pics from around the island this week. 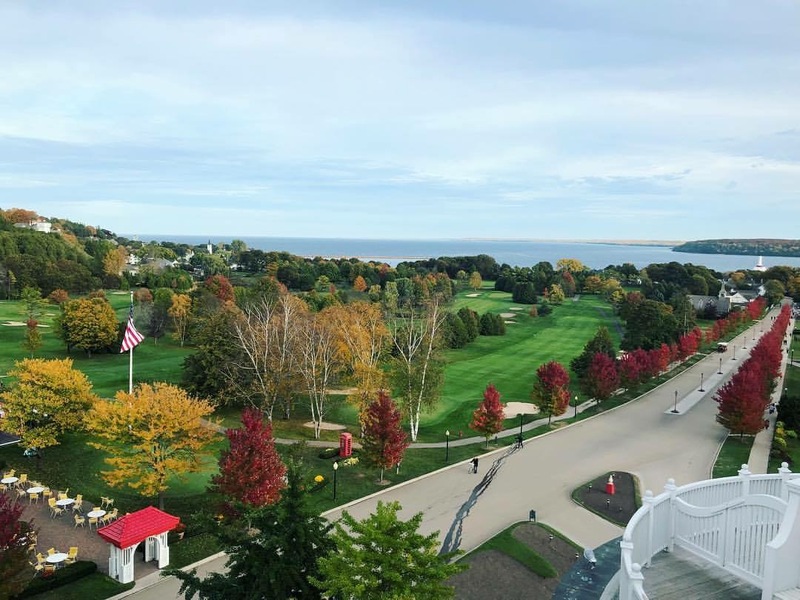 I wish I had a lot more fall colors to show, but those last three weeks of warmer-than-normal weather postponed the height of the “leaf” season on Mackinac. 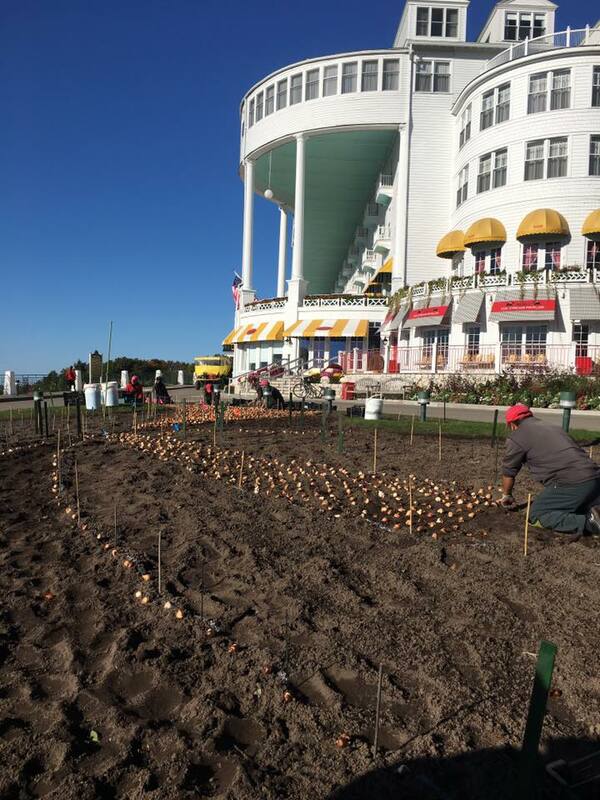 It’s coming though, and those of you who have plans to visit Mackinac the last two weeks in October should be in for a great show! Bodie (and yours truly) is sure going to miss our after-dinner walks in the cool, crisp air. All the corn stalks and mums downtown herald the fall season. There was a bride and groom in that carriage passing in front of the Chippewa Hotel! Dinner last night in the Chippewa Dining Room. Ted splurged and had the Cowboy Steak, and I had the Pasta Di’Angelina with Chicken. Yum! Looking down Market Street to the sparkling waters of Lake Huron! 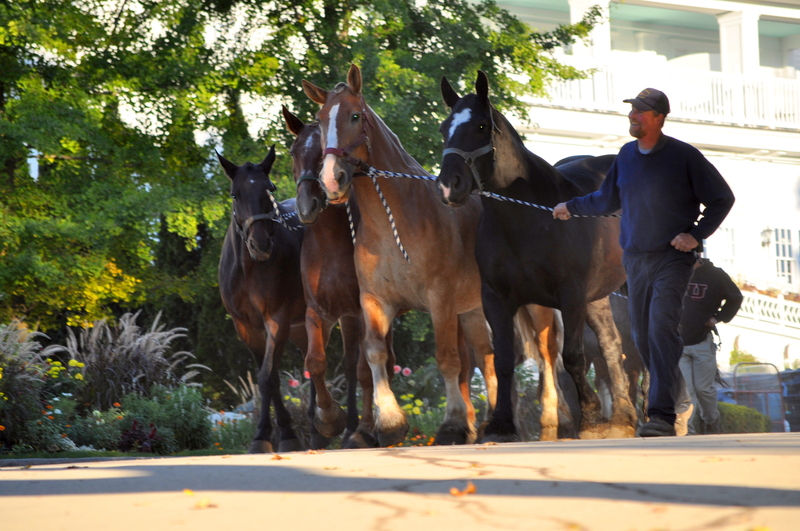 Also going to miss watching Grand Hotel horses play in the corral outside the condo! Fall colors in the maples that line Cadotte are coming on strong! 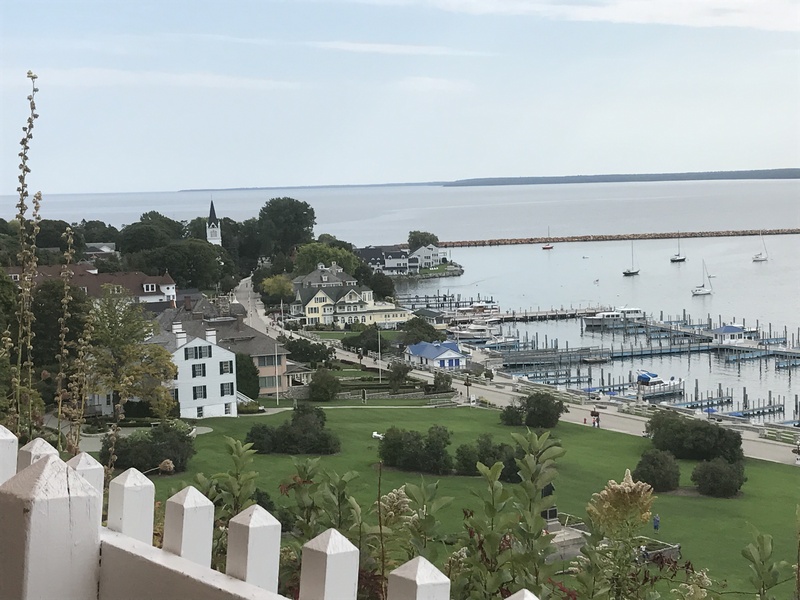 A brief visit to Petoskey this week – a great little Michigan city with a booming downtown. Colors were more prevalent there. Strange because they are south of Mackinac. Fall decorations at Shepler’s dock in Mackinaw City. Please remember us as we travel back to Florida. 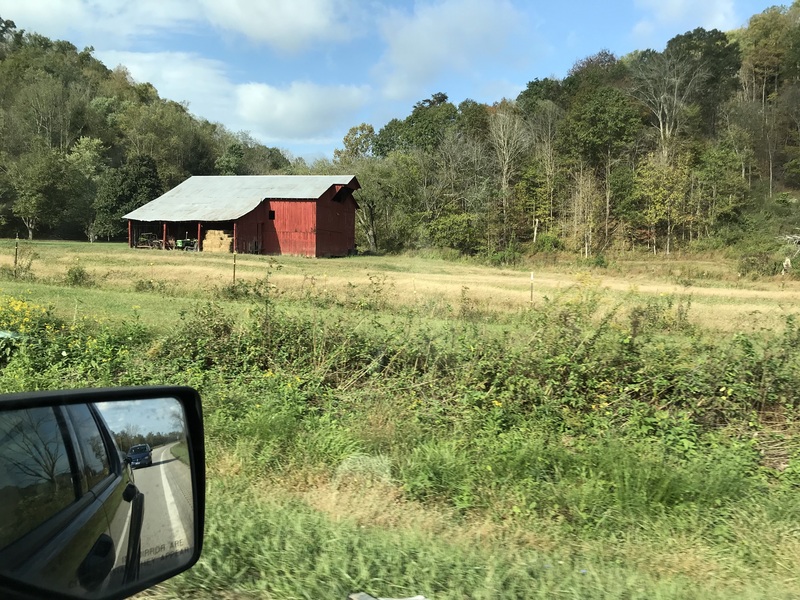 We’re skipping Atlanta this year and going home by a new route – through the Carolinas instead of Kentucky and Tennessee. Hoping to see some fall colors along the way! I’ll be posting on Facebook as we wind our way south. We’re excited to get back to our Florida home, friends, and family. I’m hoping the cool weather will follow us home, cause our Florida friends have sure had a hot, humid, and stormy summer. They are ready for a cool-down! 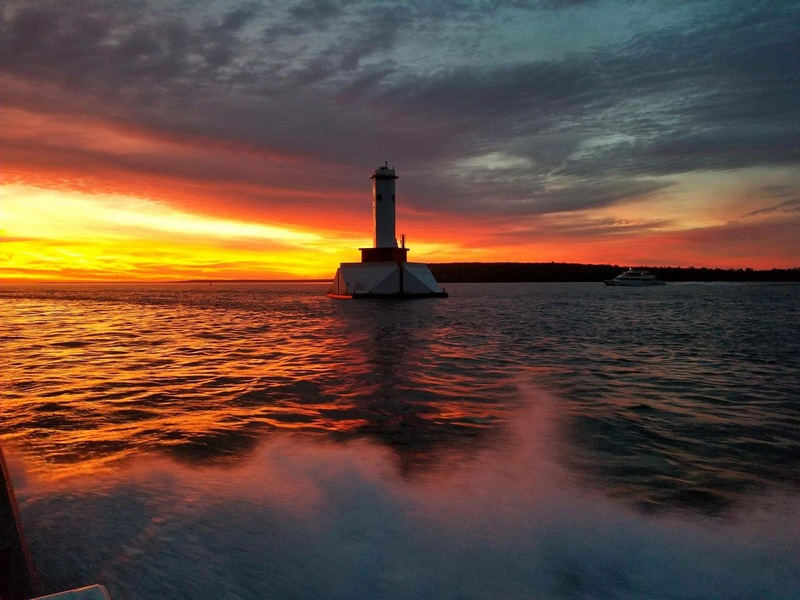 We’ve had such a great week on Mackinac. It feels like Fall again, and today (Saturday) is one of those rain-all-day, blustery times when you want to pull on a sweatshirt, and a pair of sweatpants and fleecy socks and just sink into the sofa with a good book. 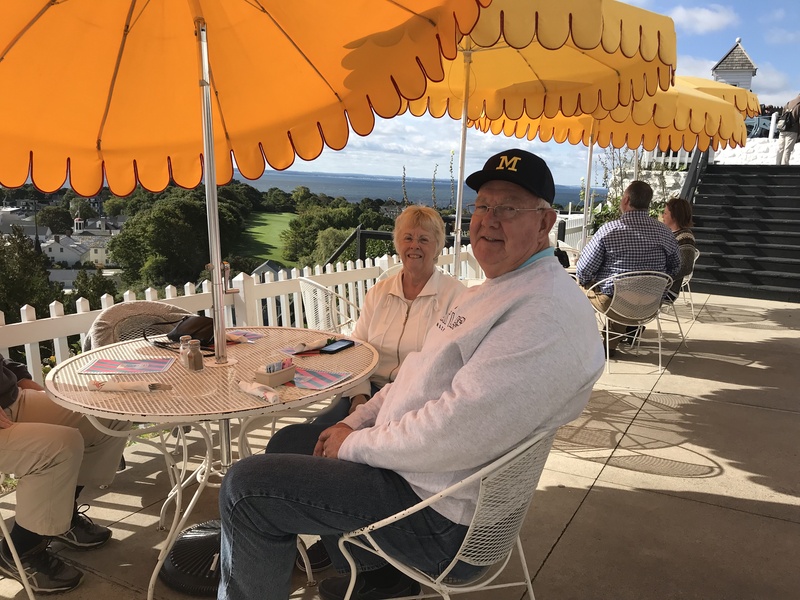 Fortunately, the rain held off until our company, Dave and Diane Bennink, had come and gone. 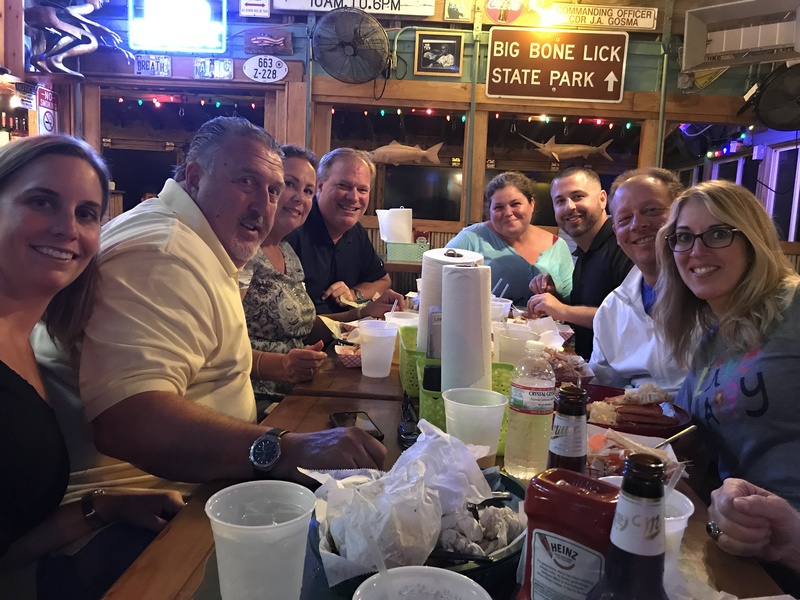 They were only able to be here for one night, but we sure enjoyed them while they were here! 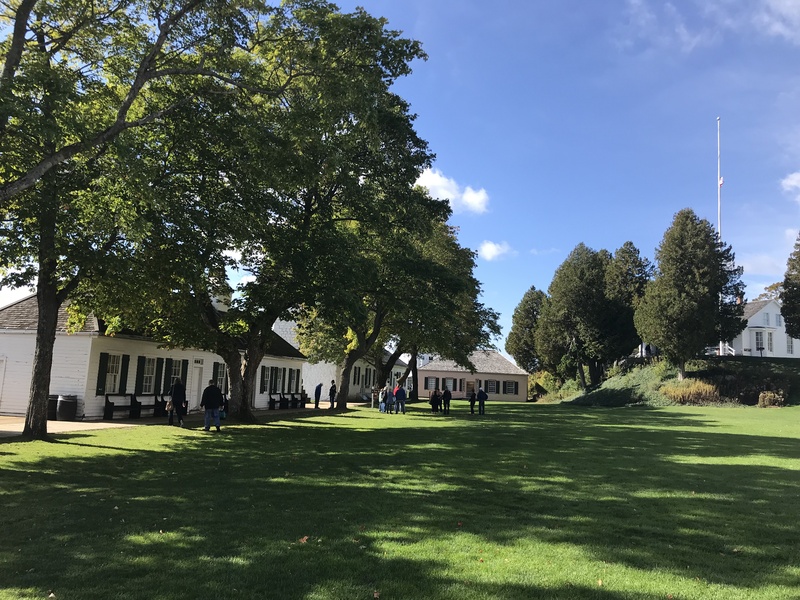 There were a few places we didn’t hit when Dave and Di visited last summer, and one of those was the Tea Room at Fort Mackinac. 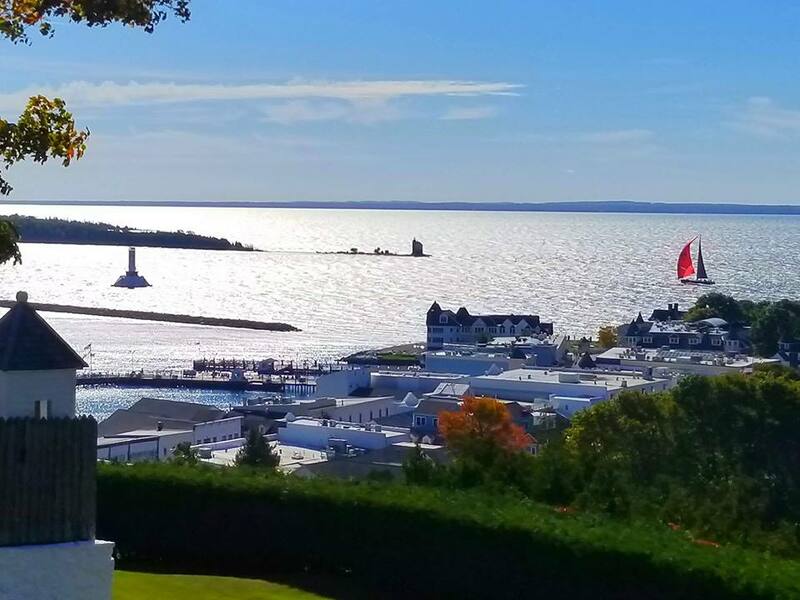 It has one of the best views of Mackinac’s downtown and marina area, and even though it was windy we chose to sit right out there on the edge of the cliff and enjoy the sunny day and the activity down below. 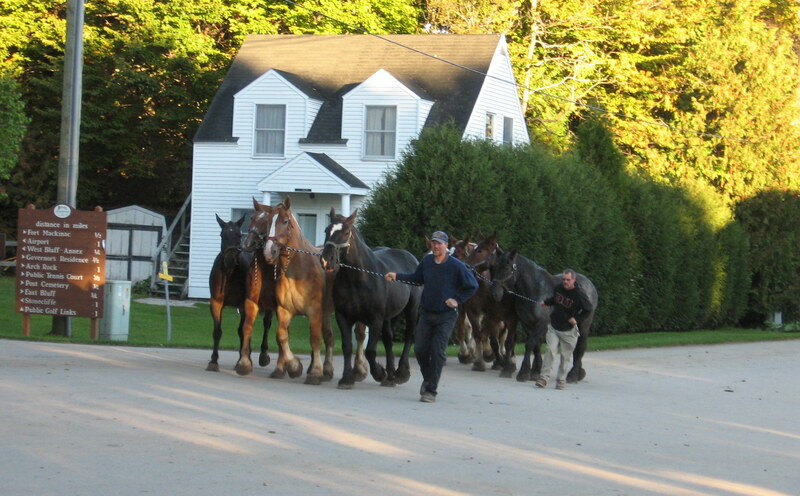 Di visited with the horses that were in the turn-out corral next door (this is one of Grand Hotel’s Hackneys). It’s been SO HARD not to sneak carrots and sugar cubes out to these beautiful creatures all summer. But – we’ve faithfully abided by the rules. 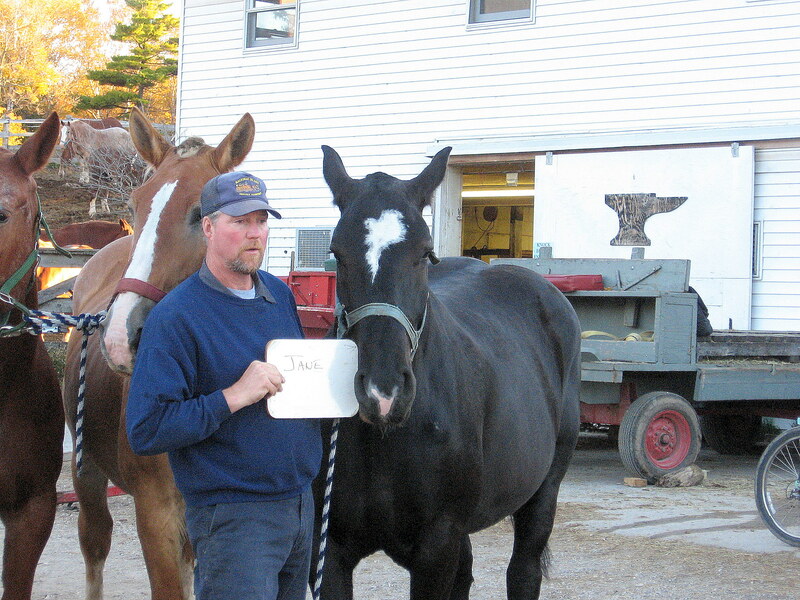 They did tell us we could bring horse treats up to the barn and they’d mix it in with their regular food. It’s not what we might feed them that’s the problem – they just don’t want anyone to get fingers nipped in the process. 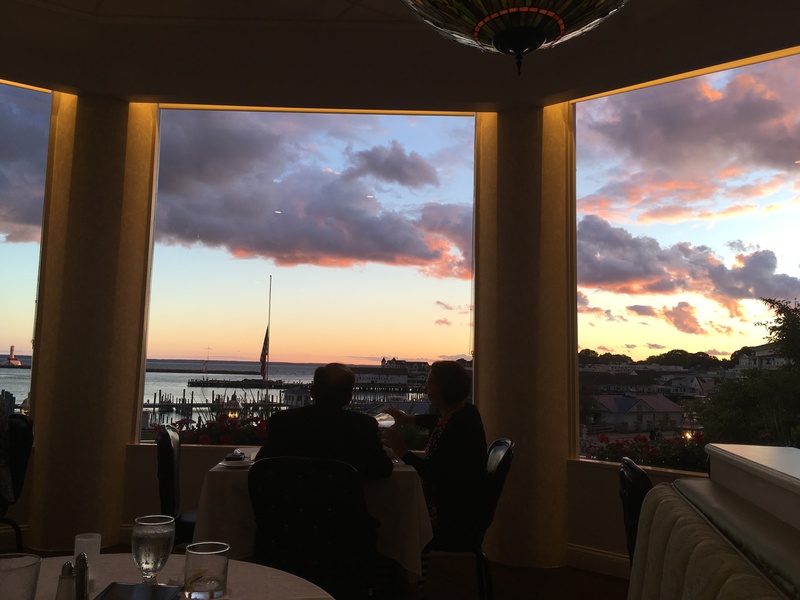 We had dinner with Dave and Di at 1852 Grill Room at Island House Hotel, where the food and the sunset were fabulous. Ted and newly found cousin Dave – walking ahead of Di and I on the way back from the fort. 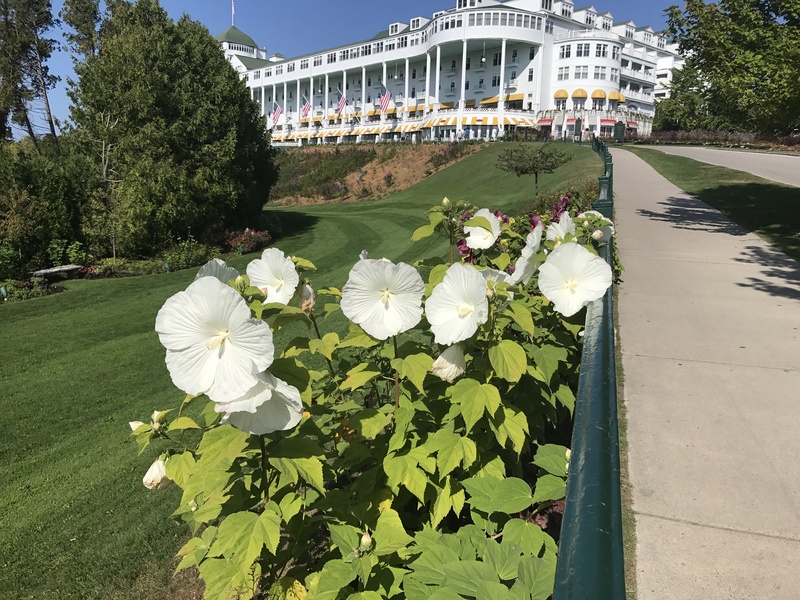 We’re hoping y’all come back next summer for a longer visit! 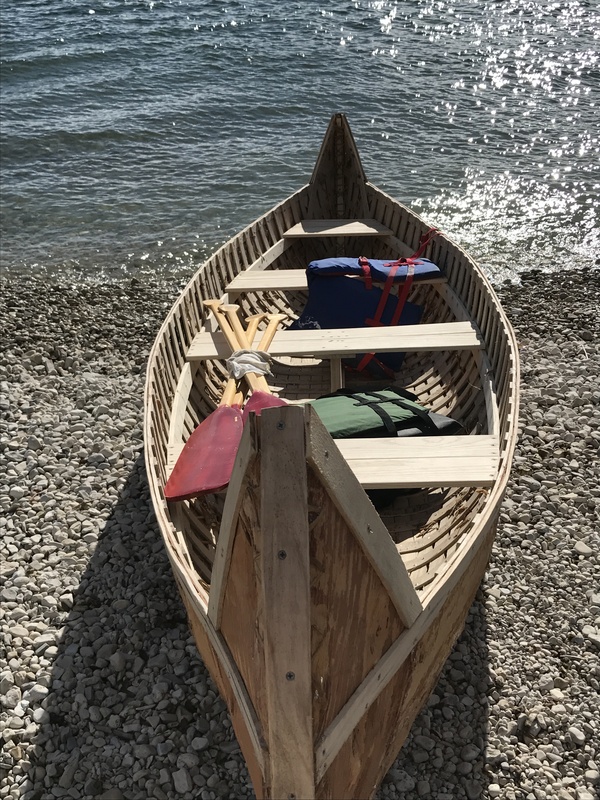 One of our sweet condo neighbors, Craig Harris, texted me a couple of weeks ago to share that a birch bark canoe was being constructed at the Mackinac Island Public School, and students were taking part in the process. Unfortunately, that was the week I was off-island for appointments every single day – so I missed the construction part. But – I was on hand last Saturday when the canoe was launched! 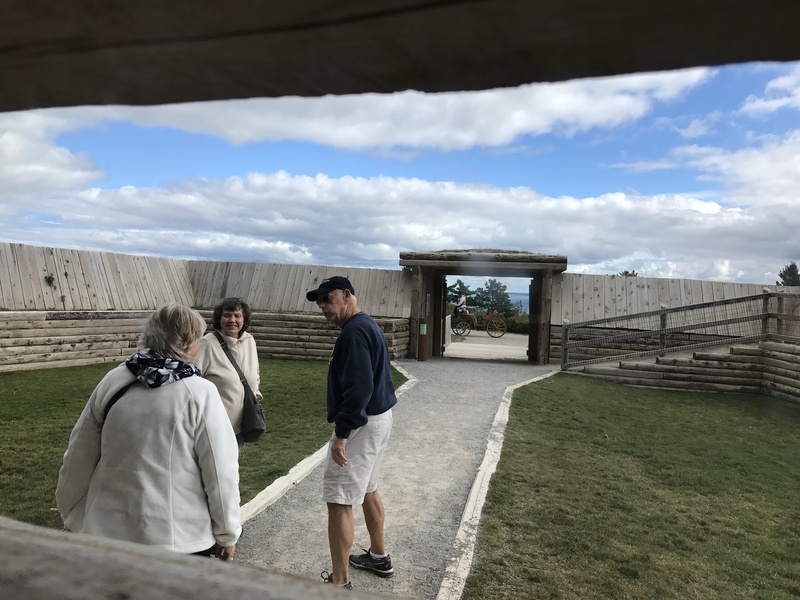 Howard Kimewon (far left) of Manitoulin Island, Ontario taught the students how to complete a birch bark canoe and also taught them terms from Anishinaabemowin, the language of the Anishinaabe people – also known as Ojibwa. 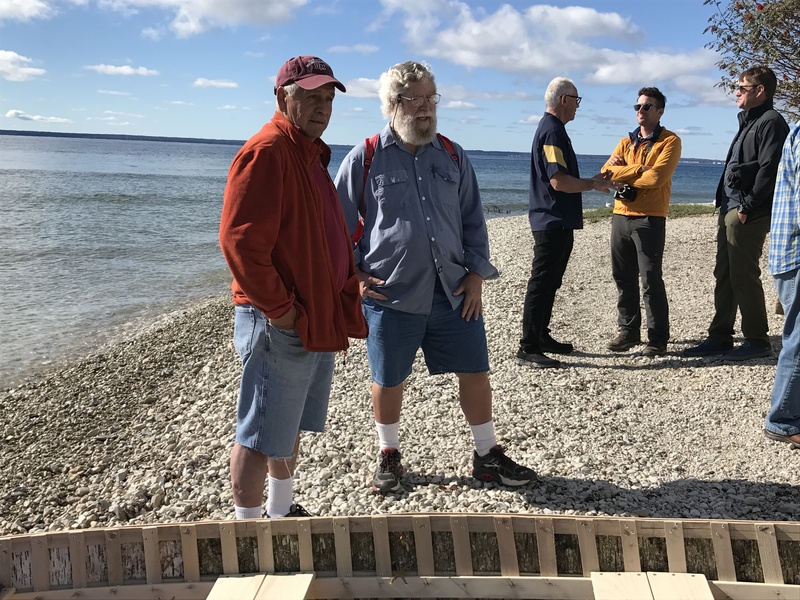 Our neighbor Craig (to the right of Kimewon) volunteered to help with the project after hearing about it while taking a Ojibwa language class that Kimewon offered on the island last winter. 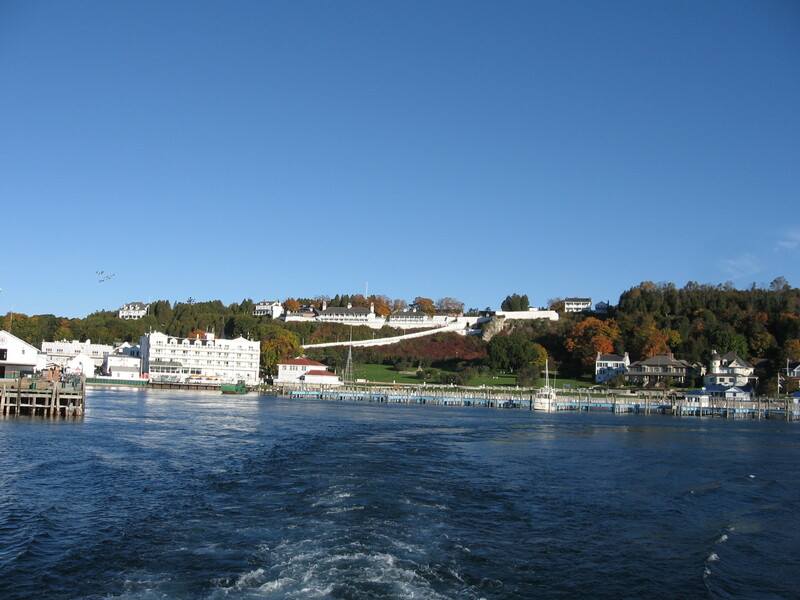 The skeleton of the canoe (made of white ash Kimewon harvested, sawed, and milled) was constructed in the Mulcrone Car Wash in St. Ignace and brought to Mackinac Island by ferry. 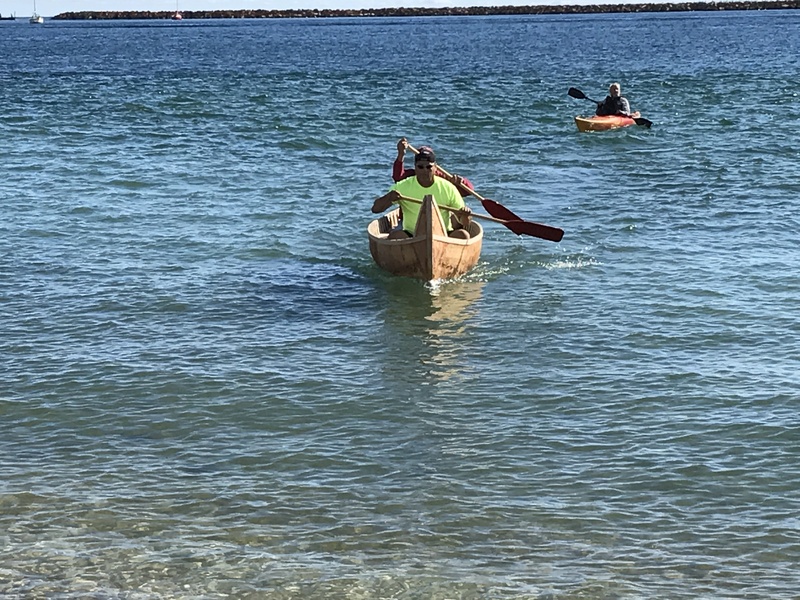 Kimewon was commissioned to build two canoes by the Michilimackinac Historical Society. The canoe is 14.5 feet long. 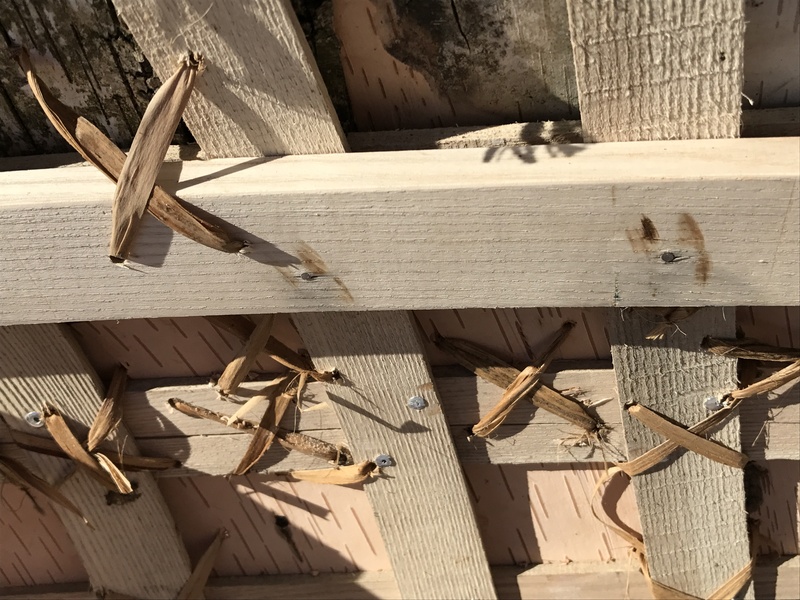 Sheets of paper birch bark line the outside and are affixed with straps and clamps to form them into shape. Fibers from American basswood trees that are soaked in water to be malleable are used to stitch the bark together. The materials were all harvested from the forest by Kimewon. 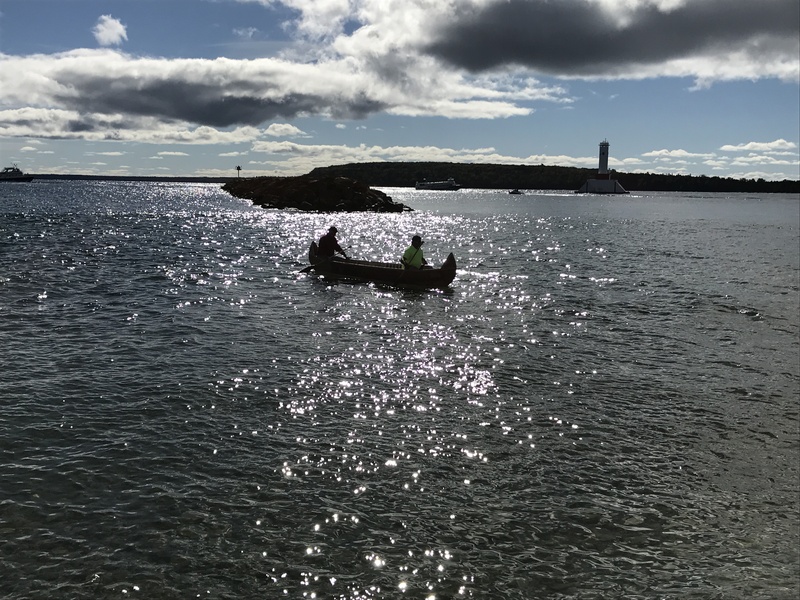 The canoe was launched off Windermere Point by Kimewon and John Perault . . .
. . . and the two men paddled for about 10 minutes within sight of the West Breakwall and the Round Island Passage Light . . .
. . . before coming back to shore. 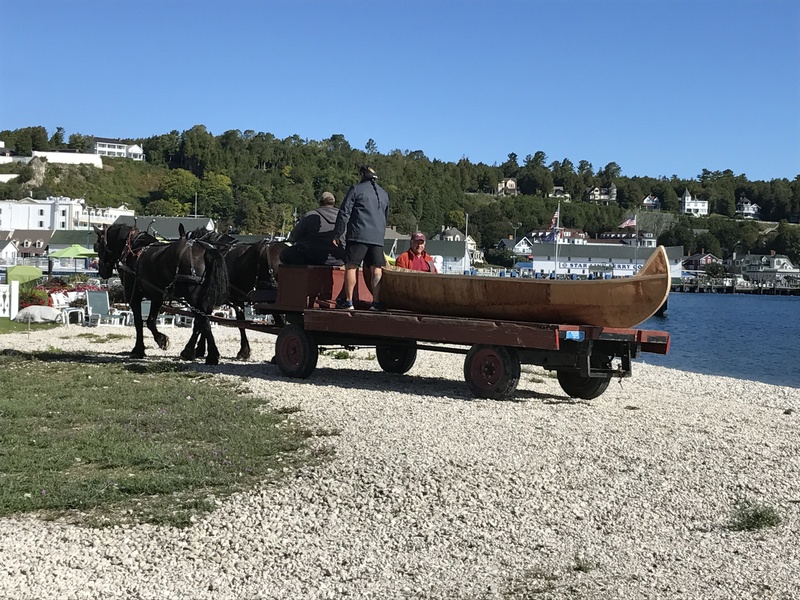 The canoe was loaded on a dray for transport by to the school and will eventually be paddled to St. Ignace. What a fantastic experience for our island school children! Hmmmm. What’s missing from this picture? A not-so-often-seen view across to the Iroquois Hotel. 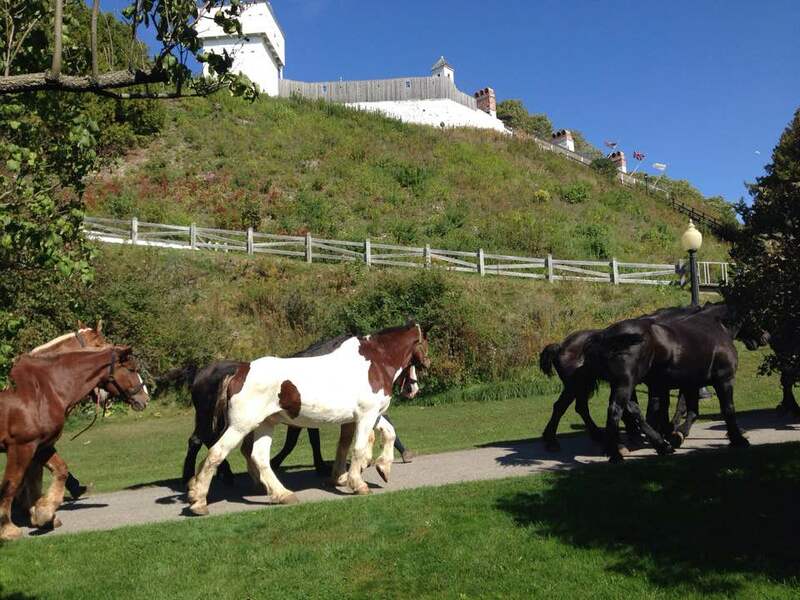 The parade ground at Fort Mackinac late in the season. As you can see, the fall colors have not arrived yet. Those three weeks of very warm temps seem to have stopped the colors from appearing except in bits and pieces around the island. 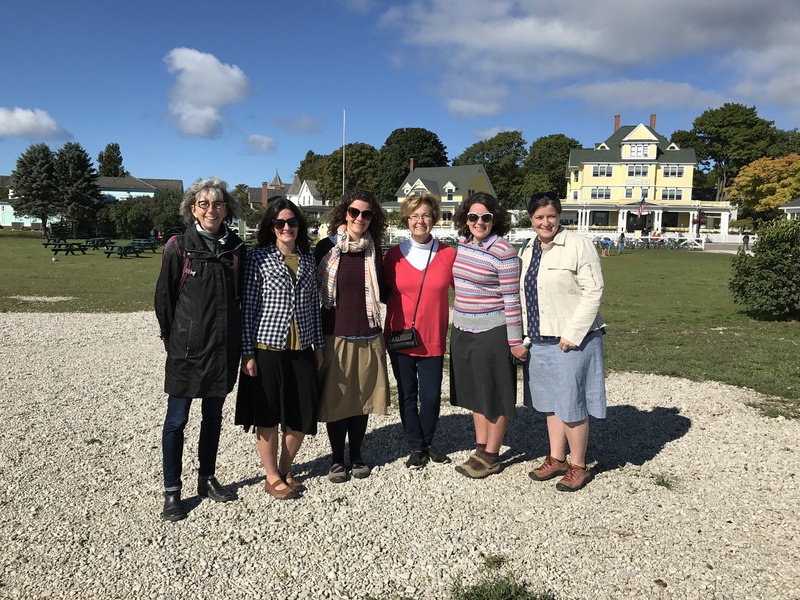 So glad these four sisters (and blog readers) introduced themselves last Saturday when the canoe was being launched. 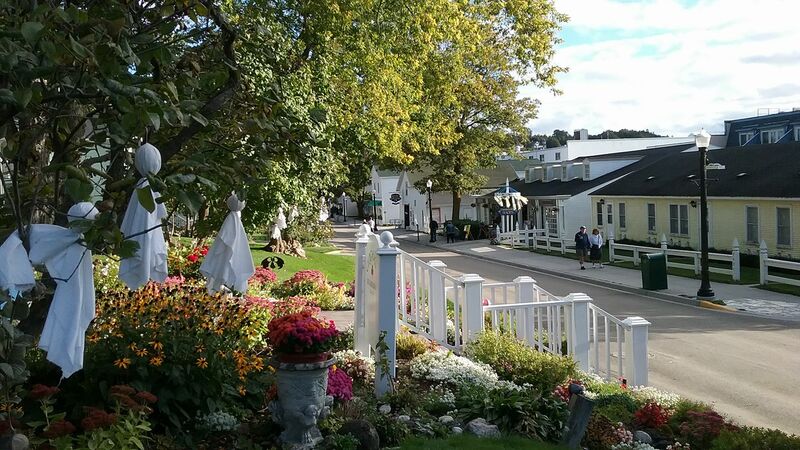 They come to Mackinac every year and stay at the Windermere. Glad Jill was there to be in the pic also! A new kid in town. 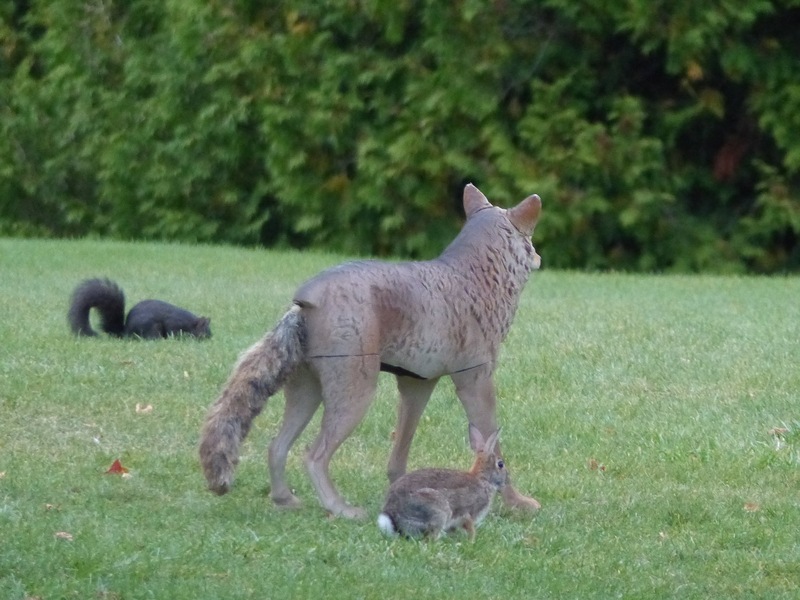 This “pretend” coyote has appeared in several areas around the island as a deterrent for those pesky – and messy – Canadian geese. Don’t know what affect he’s having on the geese, but apparently the squirrels and bunnies have figured out he’s not real! (My apologies for not saving the photographer on this photo. Bruce LaPine? Tom Chambers? Jason St. Onge? Greg Main? The ending of a lovely night with Dave and Di. A drop off at the condo under a partially-obscured-by-clouds full moon. I do love this place. By this time next Saturday we’ll be on our way back home. It’s not nearly as much fun to pack up for the trip back as it is when we’re heading north. 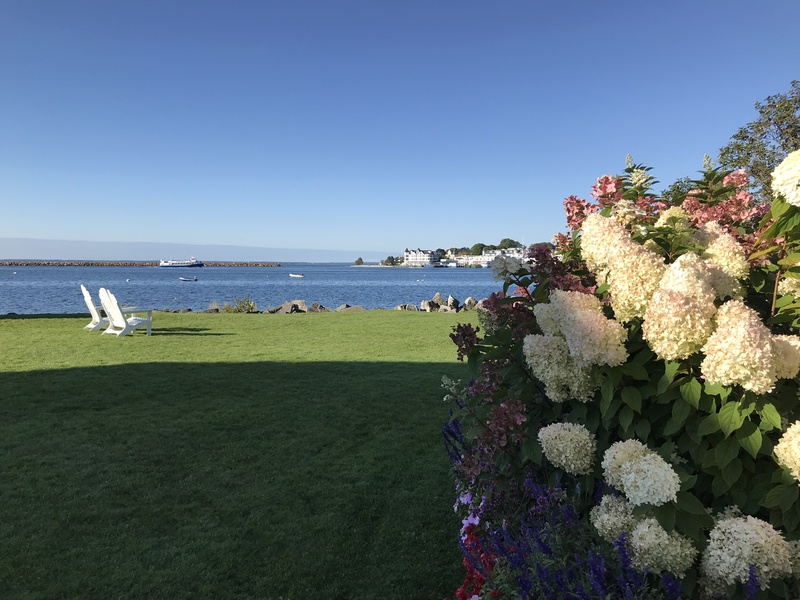 But – we’re ready to get back to Julie, Matt and the grandkids, our Beverly Beach friends, and our home. 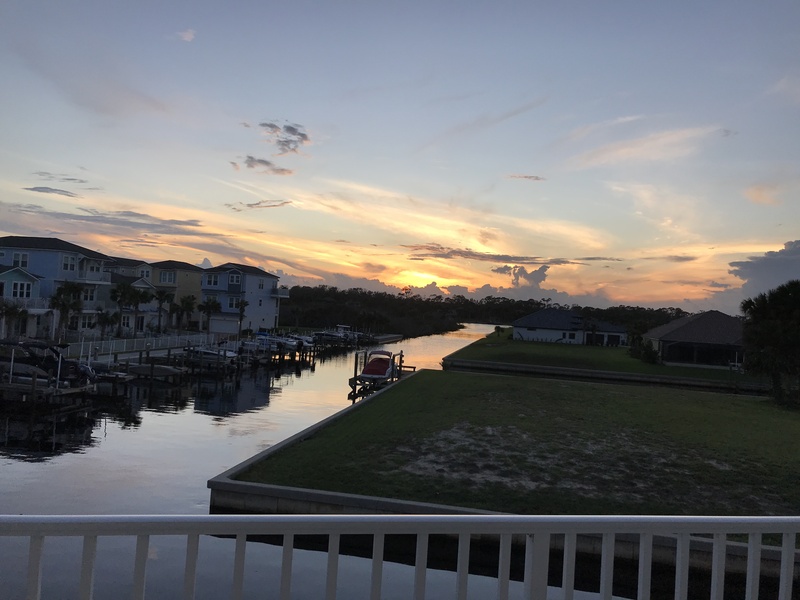 They’ve all endured the wrath of Irma while we’ve been gone, and even though our house had very little damage, others in our neighborhood were not so fortunate. Also, Flagler Beach sustained much more property damage from Irma from storm surge than it did last year from Hurricane Matthew. It’s going to be hard to see our little old Florida beach town so changed. Hope to have one more post before we leave, but if not, I’ll let you know when we’re safely home. Love you all. Last week was busy and so much fun! Ted’s sister Sheryl and cousin Heidi came for a visit, and we spent three days doing lots of touristy things, as well as just spending time getting to know these newly found members of our family. After two weeks of above average temperatures (I think we hit 85 one day! ), we had a cold front come through the first night our company was here. From that point on we had absolutely beautiful blue skies, crisp temperatures, and the definite feeling of Fall in the air! Sheryl and Heidi arrived on Tuesday morning, and I know they thought we were going to walk them all over the island before bedtime that night. 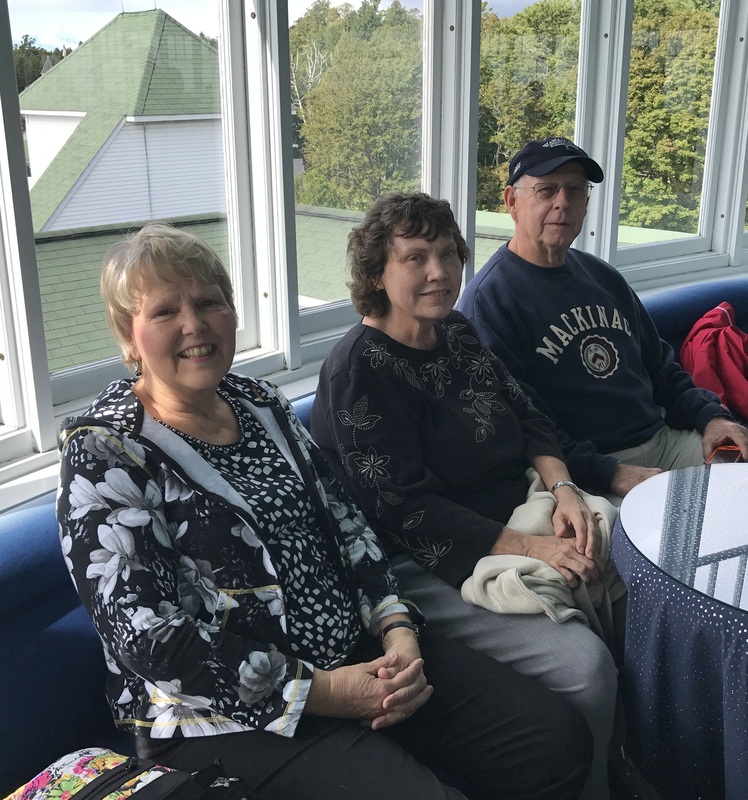 We started with lunch at the Tea Room at Fort Mackinac . . . .
. . . . which is absolutely one of the top five “view” spots on Mackinac! We roamed around the fort, visited Sutler’s Store, and then walked back to the condo. Later in the afternoon we walked over to the West Bluff, hiked Pontiac Trail, and walked around the Annex. By the time dinner rolled around we were all starving, and we all turned in early that evening. On Wednesday we had planned a special surprise for Sheryl and Heidi. We started with lunch at Grand Hotel . . .
.. . . . and a visit to the Cupola Bar at the very top of the Grand. 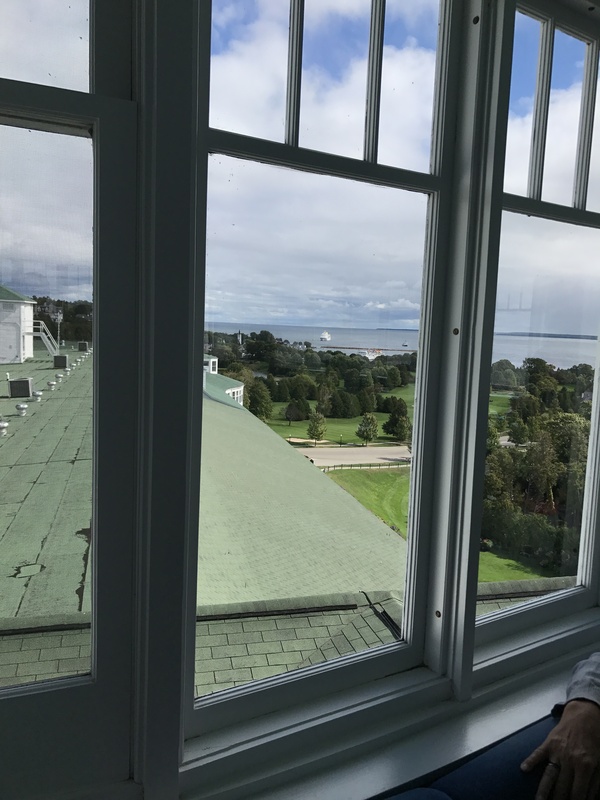 Another one of those top five “view” spots on Mackinac! We then went to the Grand porch and rocked for a little while, just watching people and enjoying the sunshine. 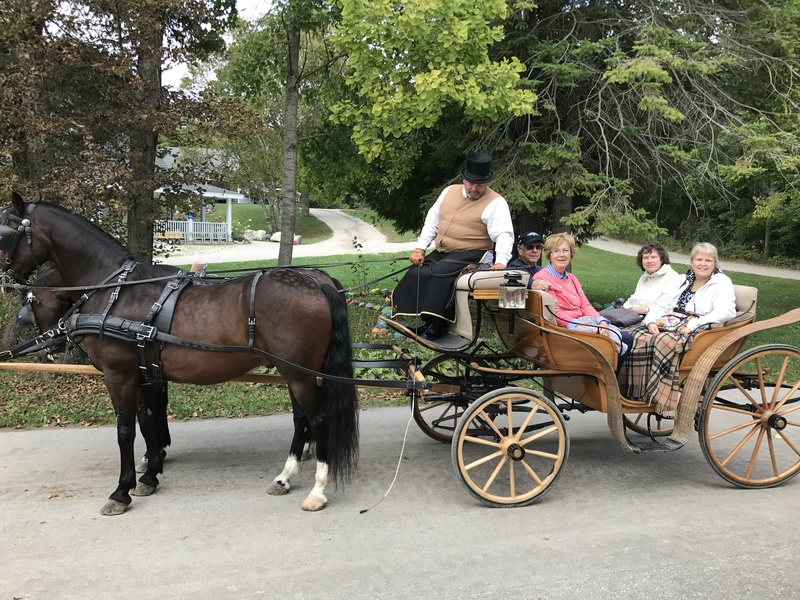 The big surprise arrived when Ben Mosley drove up in one of Grand Hotel’s vintage carriages and welcomed us aboard. 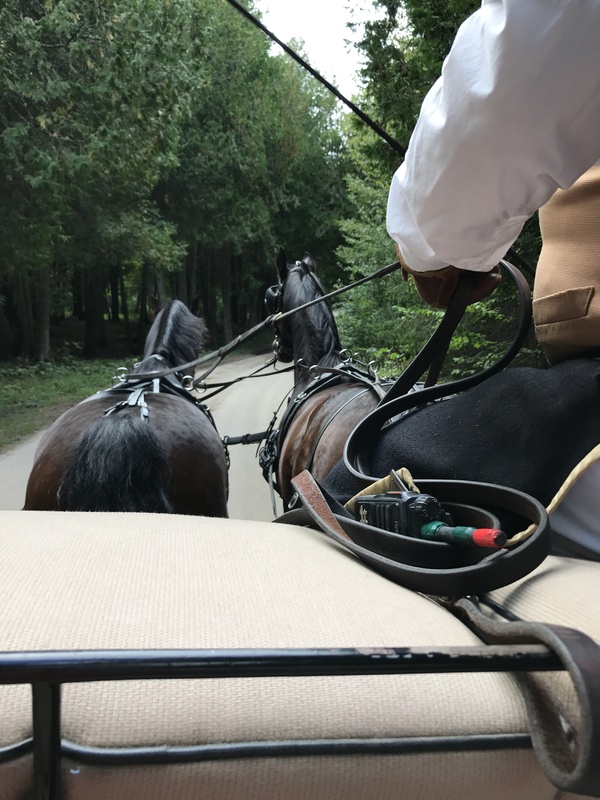 We spent the next hour touring several of the top tourist attractions on Mackinac, as well as just enjoying riding through the woods in a carriage drawn by two beautiful Hackneys showing off their footwork. 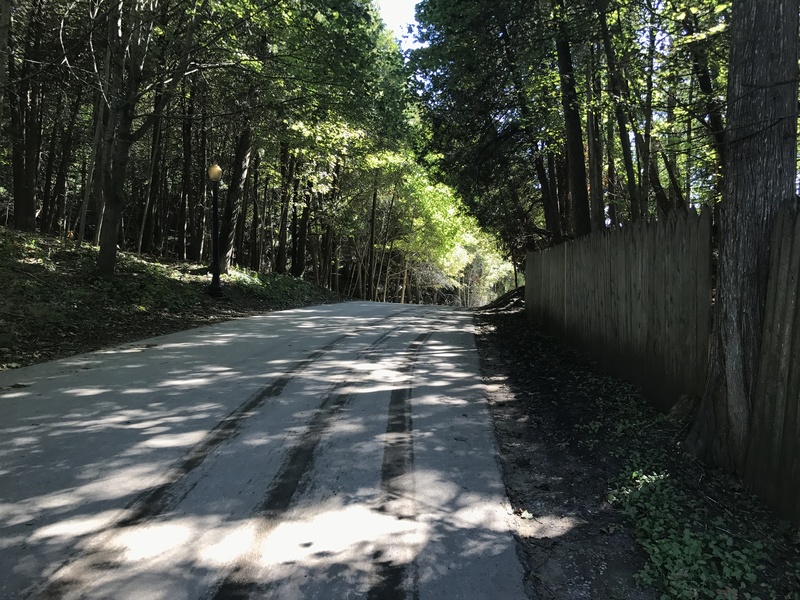 The tour started off with a ride through the Annex and out to Stonecliffe, followed by . . .
. . . riding up to Lookout Point via this wooded road which turns steeply upward at the cemeteries. We took a few minutes to get off the carriage . 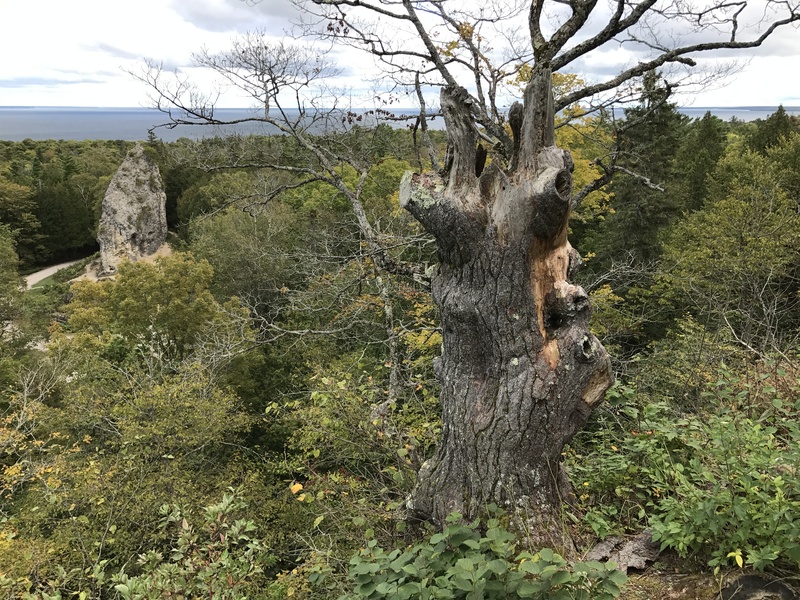 . . .
. . . for a great view of Sugar Loaf, an expanse of wooded land, and Lake Huron in the distance. Although those clouds looked a little menacing, we didn’t get a single drop of rain on our “parade”. 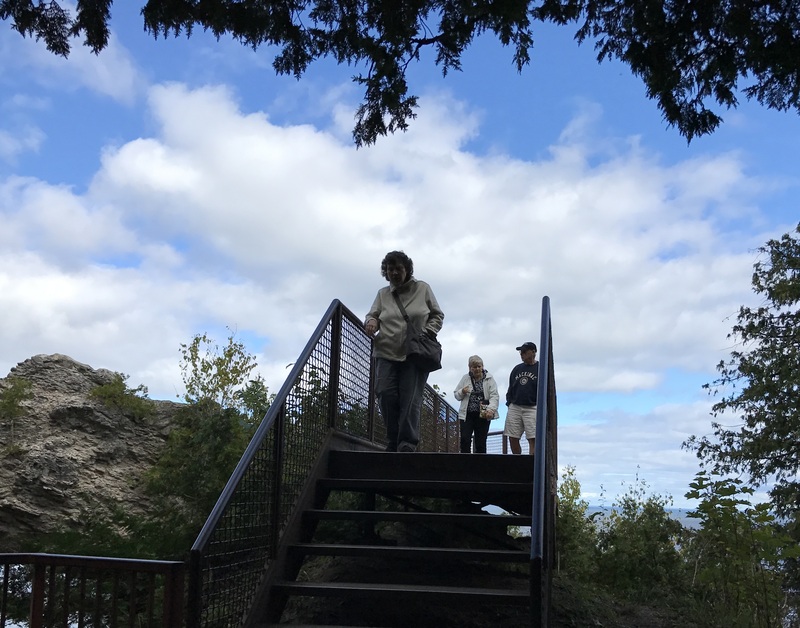 We next visited Fort Holmes, the highest spot on Mackinac . . .
. . . followed by a stop at Arch Rock. It really doesn’t matter how many times we visit all these places. Each time is special, and I’m glad we made it to all these spots one more time this year. 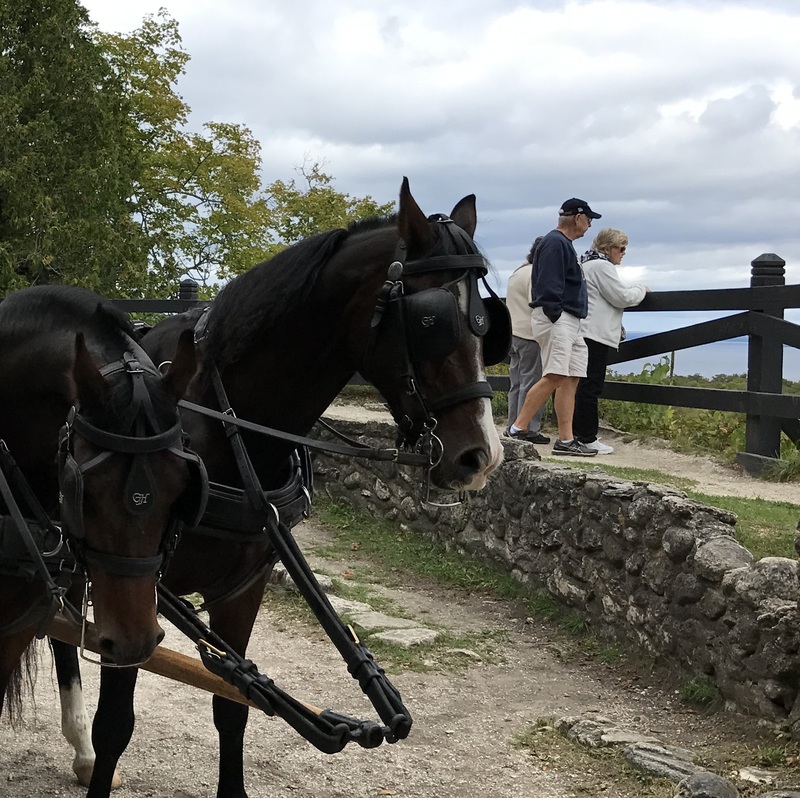 Although Heidi and Sheryl both had been to Mackinac Island before, they saw a few places they’d never seen and really enjoyed the tour and the carriage ride! We finished the day with dinner at the Chip and a taxi ride home. 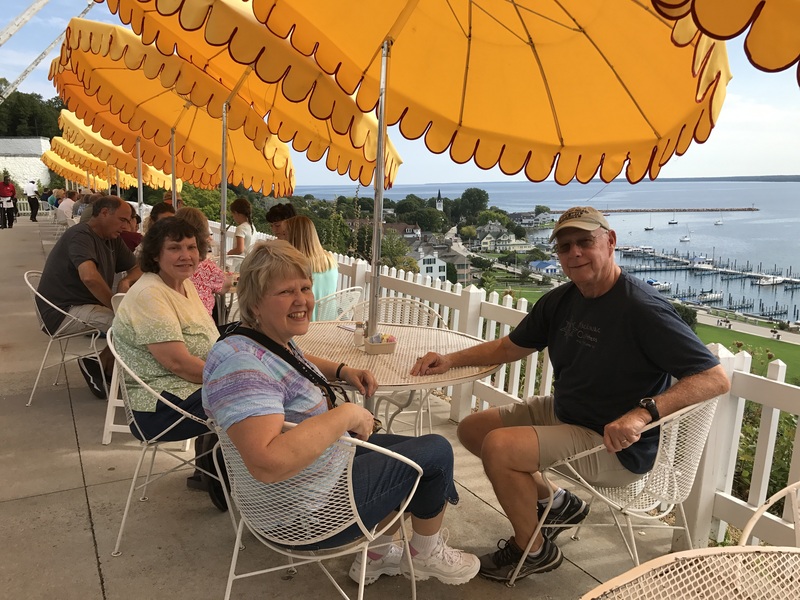 Thursday was spent visiting with the current residents of an East Bluff cottage where Heidi and her family had past connections, lunch downtown, and then a visit with old friends of the family. We were up early on Friday morning to take a taxi downtown and have breakfast at The Chuckwagon before the ladies caught the ferry off the island. We were sad to see them go. We had spent Thursday evening at the condo, laughing and telling family stories. It was just the best visit, and we hope Heidi and Sheryl both come back soon. We DO have more places to show you because I promise you didn’t see everything (even though it may have felt like it). A shady walk down Huron Street right after the street cleaner had gone through. 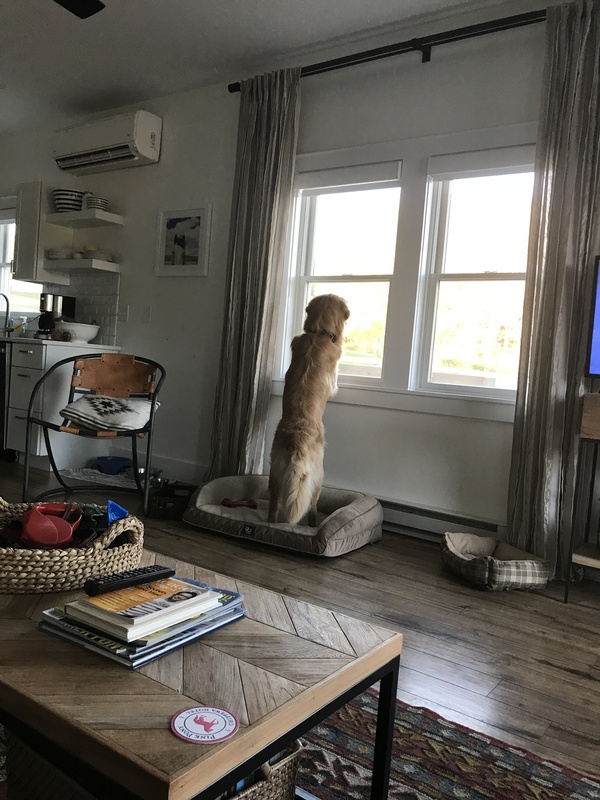 The condo’s backyard furniture arrived this week! Condo picnic soon! 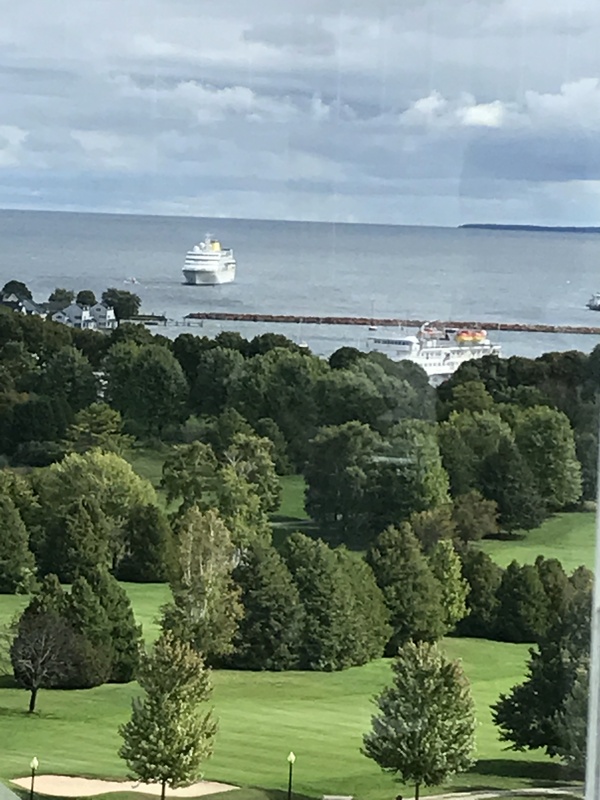 We had two cruise ships at the island on the same day. The ship anchored offshore is the Hamburg. It has too deep a draft for the big dock, so it anchors off Mission Point and shuttles tourists in aboard her four small launches. 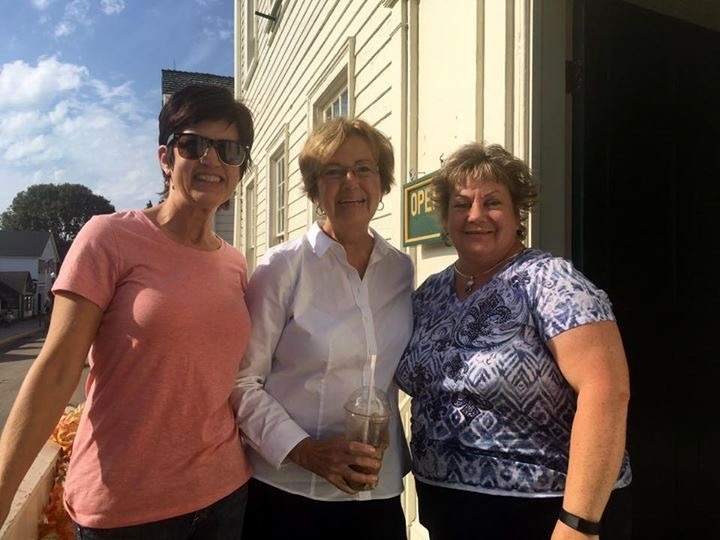 Friends and blog readers Kem Green and Yvonne Pitsch stopped by to visit me at the Stuart House this week! What are they? Morning Glories? 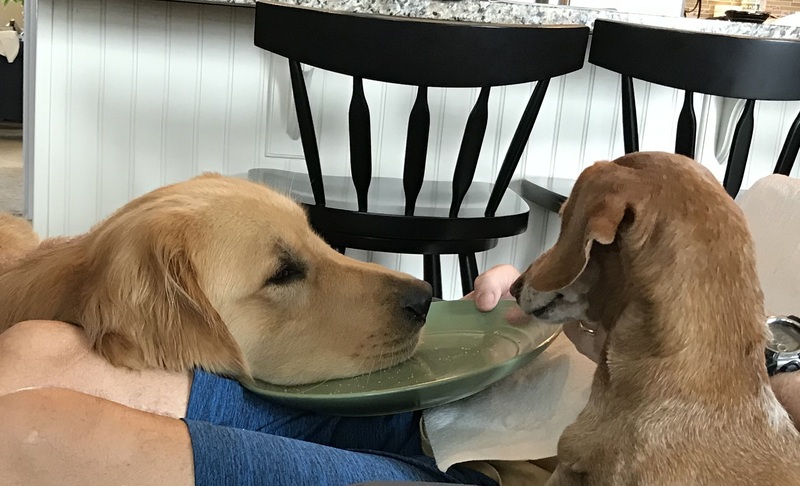 Whatever they are, they are as big as dinner plates and beautiful! 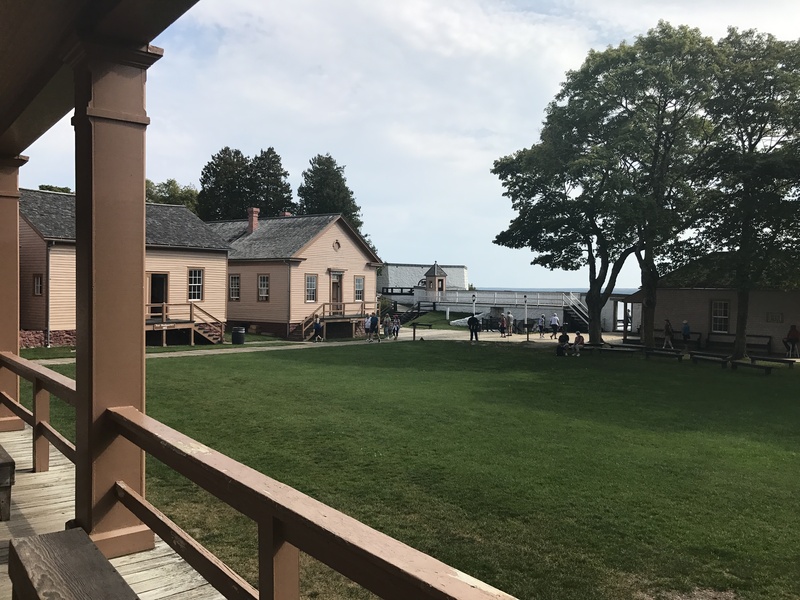 The parade ground at Fort Mackinac. 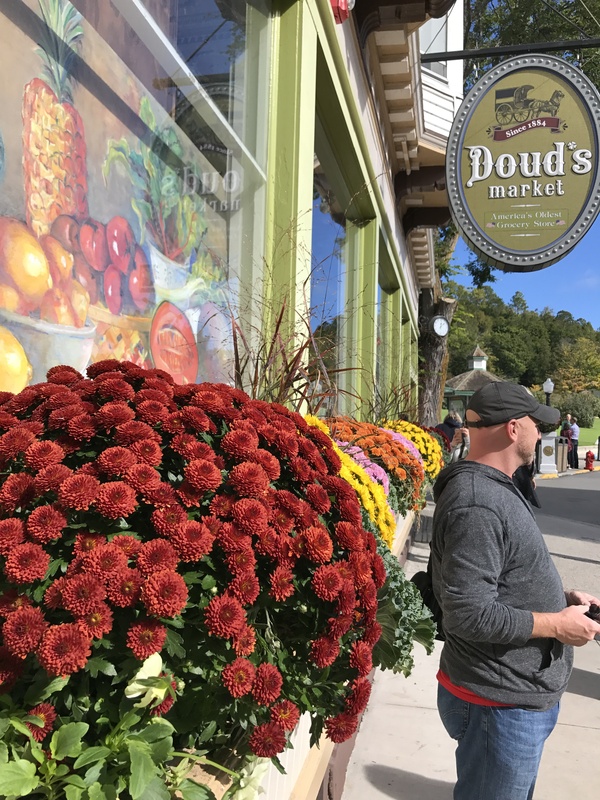 Mums the word at Doud’s Market! The view over the Hackney’s backs! 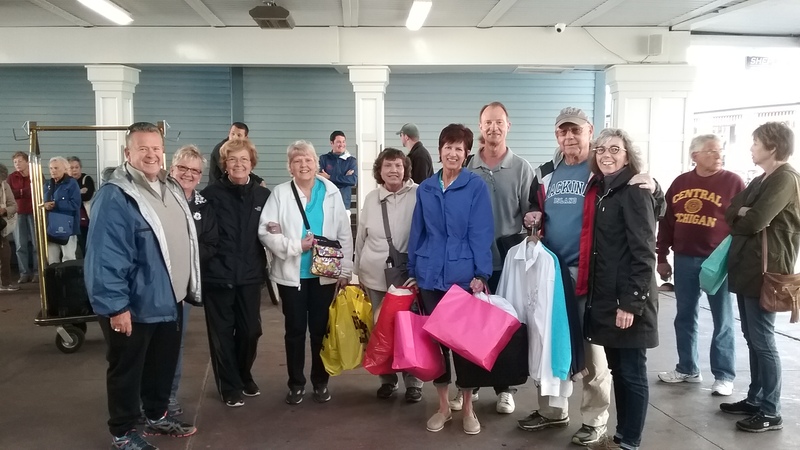 This great bunch of friends and relatives got together on Shepler’s dock Friday morning. Some were leaving, some were staying. Left to right: Mike and Pam Day, me, Sheryl, Heidi, Kem and Ed Green, Ted and Jill. Love you all! 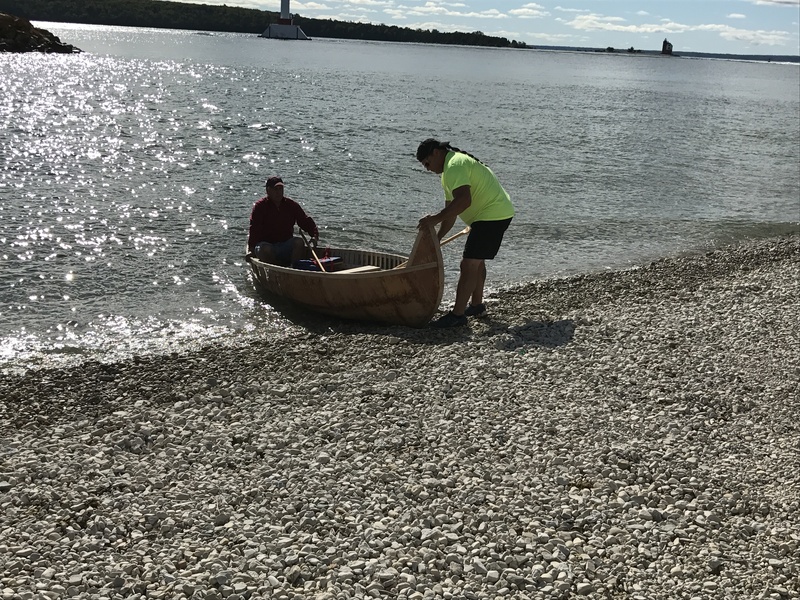 I’ve got a great story to share next time about a birch bark canoe our Mackinac Island public school children helped to build. It was launched yesterday. Coming up in a few days!